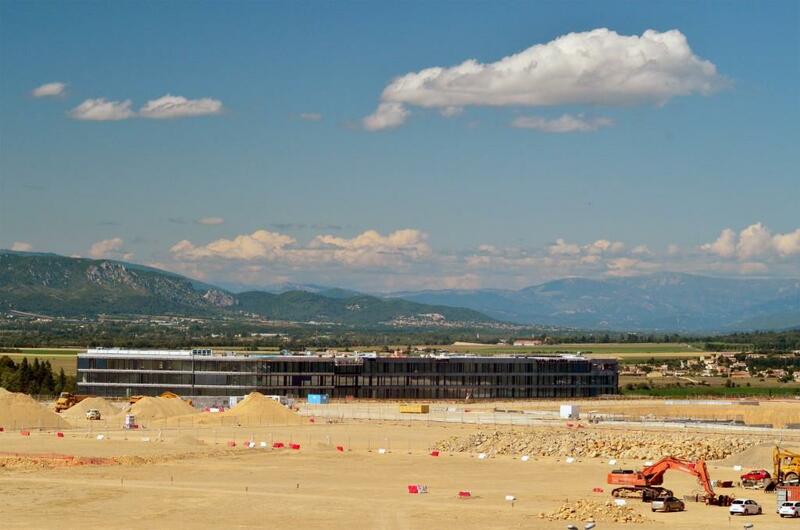 The ITER Headquarters seen from the construction platform with, as a backdrop, the town of Manosque and the Alps. 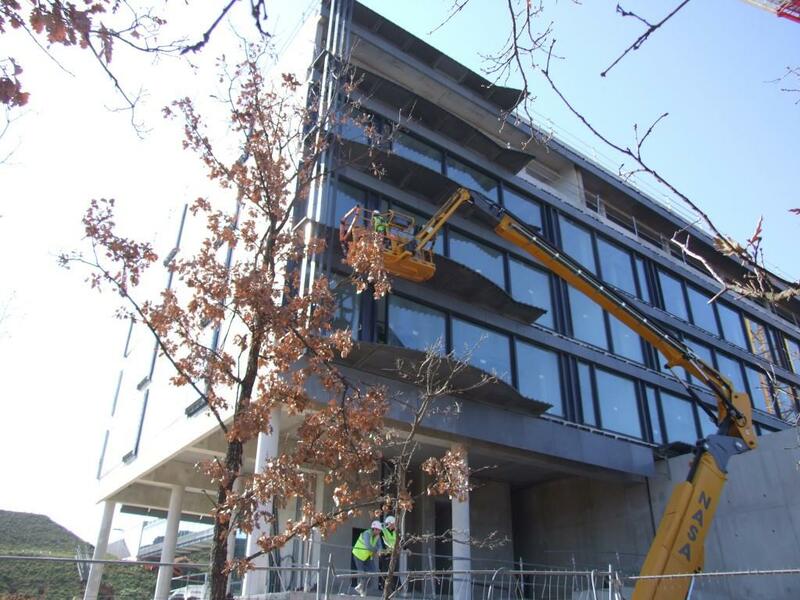 The 35-metre extension to the Headquarters building is completed in September 2014. 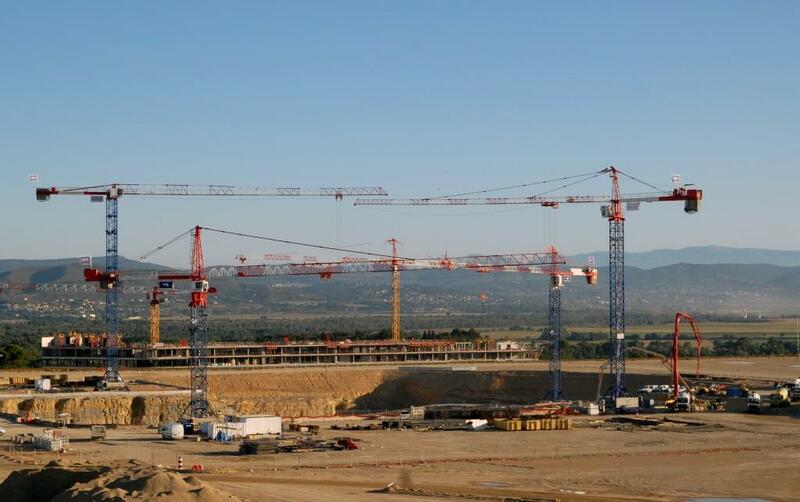 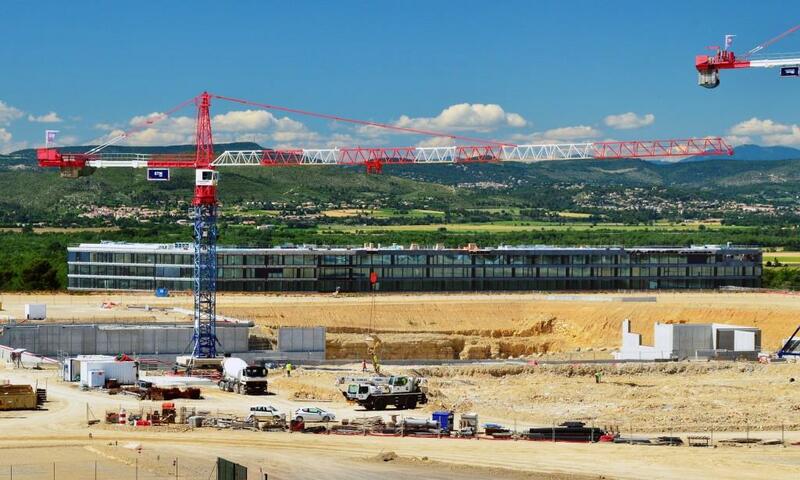 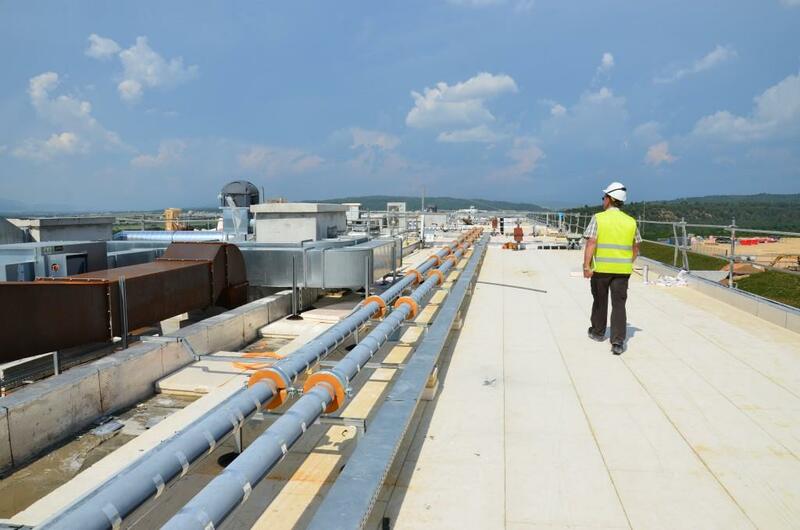 Following its official handover to the ITER Organization (on 30 September) work can now begin to carry out the necessary arrangements for move-in (furnishings, IT connections). 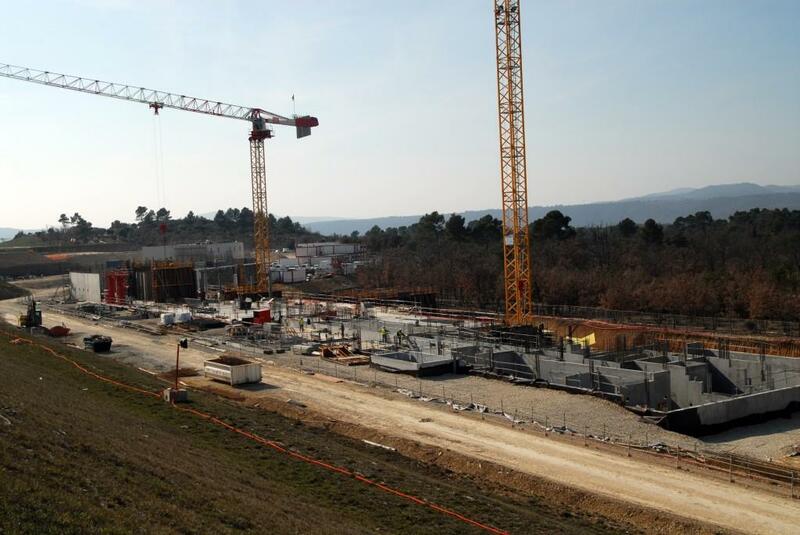 As contruction progress has now reached level 5, the ITER Headquarters extension now stands in perfect continuity with the main building. 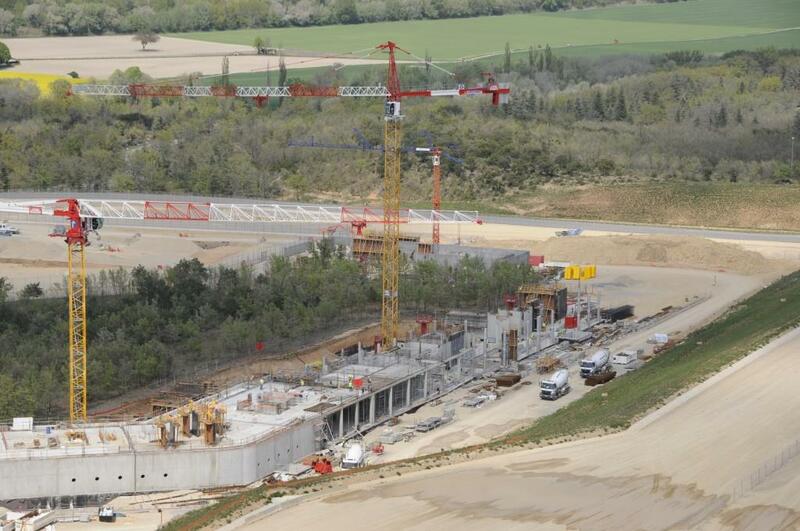 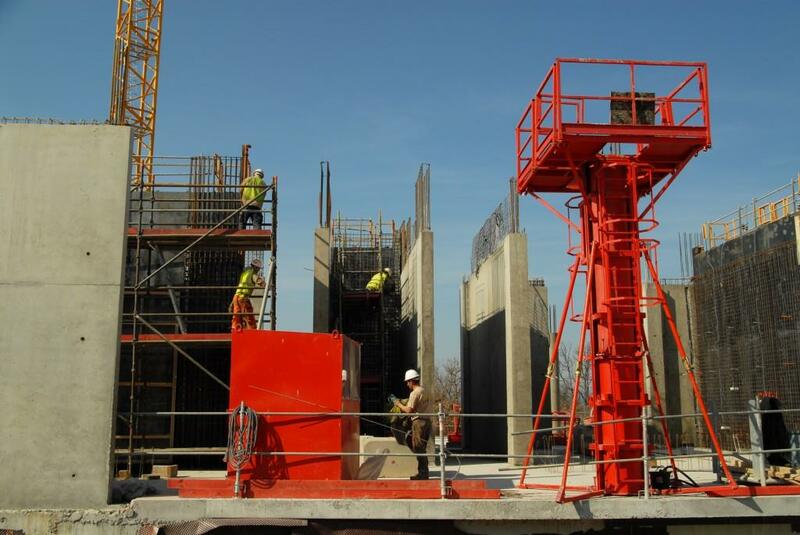 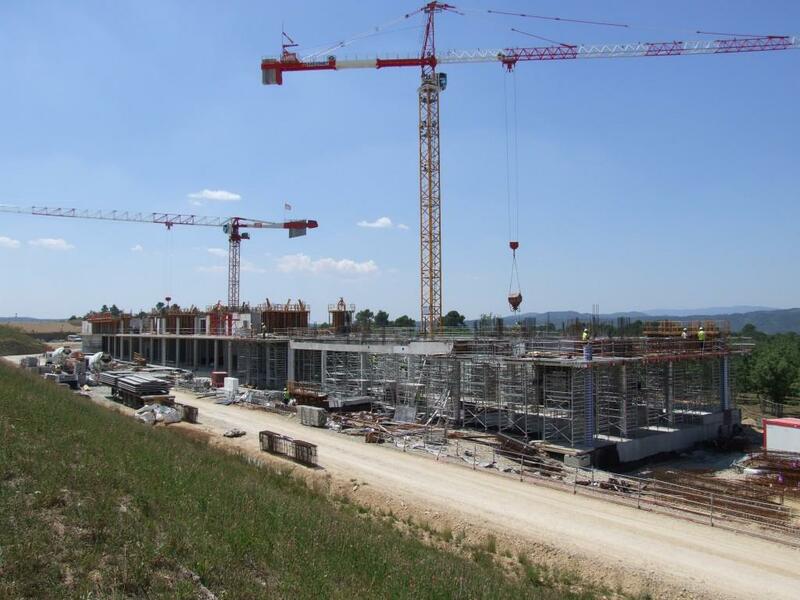 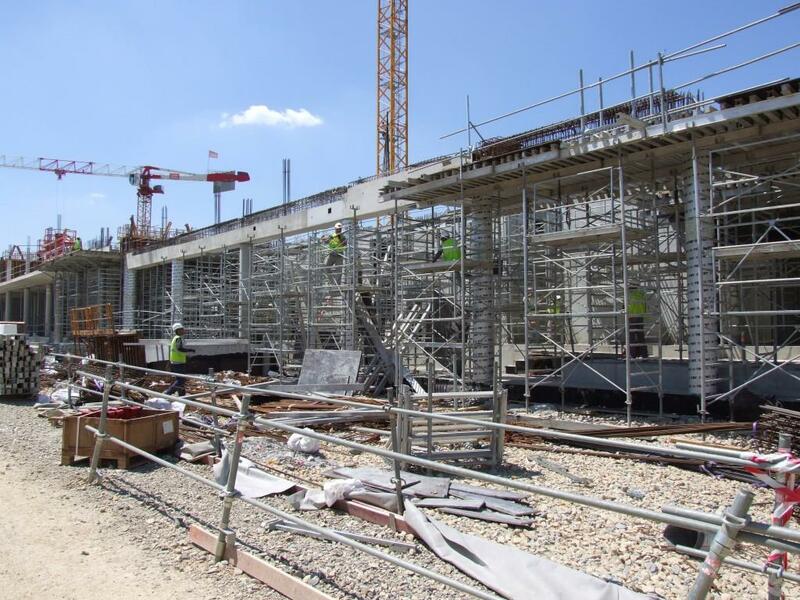 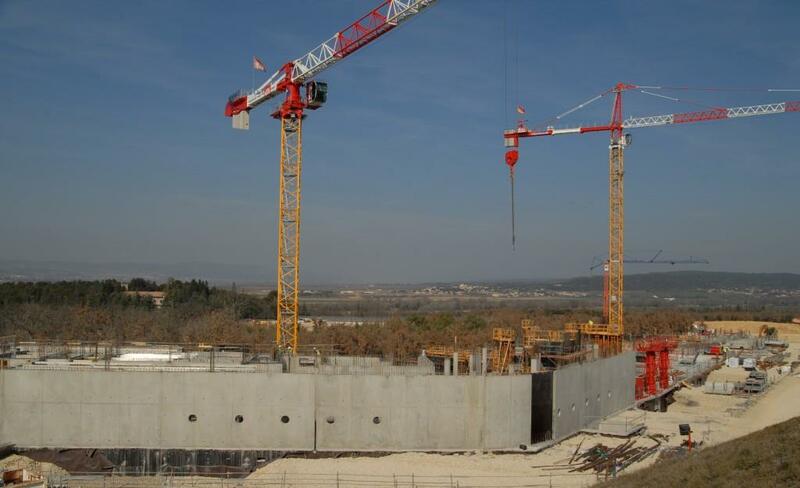 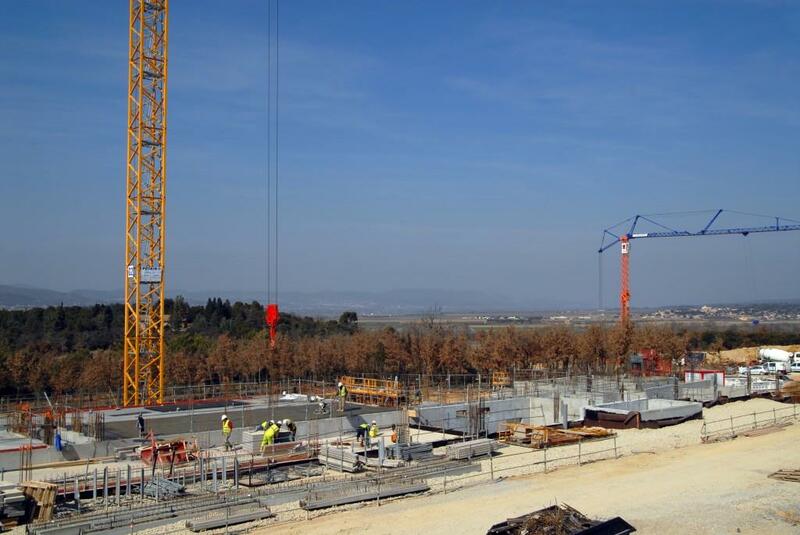 Workers progress in April on the fourth storey of the ITER Headquarters extension. 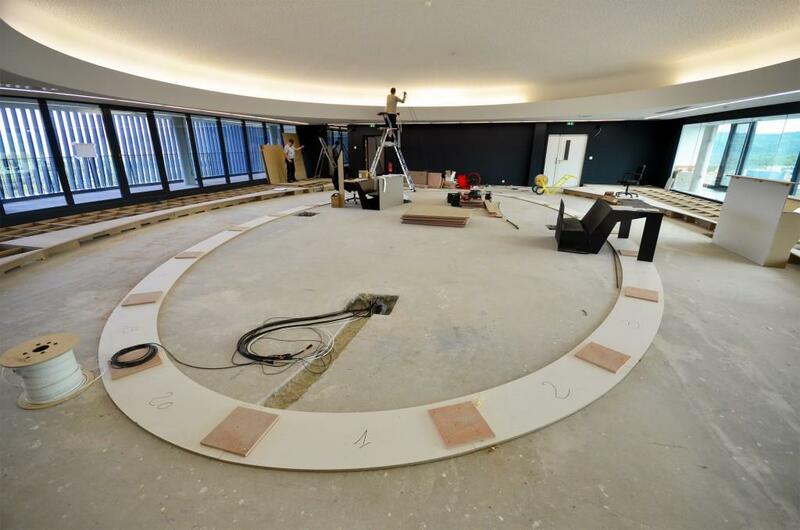 When completed this summer, an extra 350 desks will be available to staff or contractors. 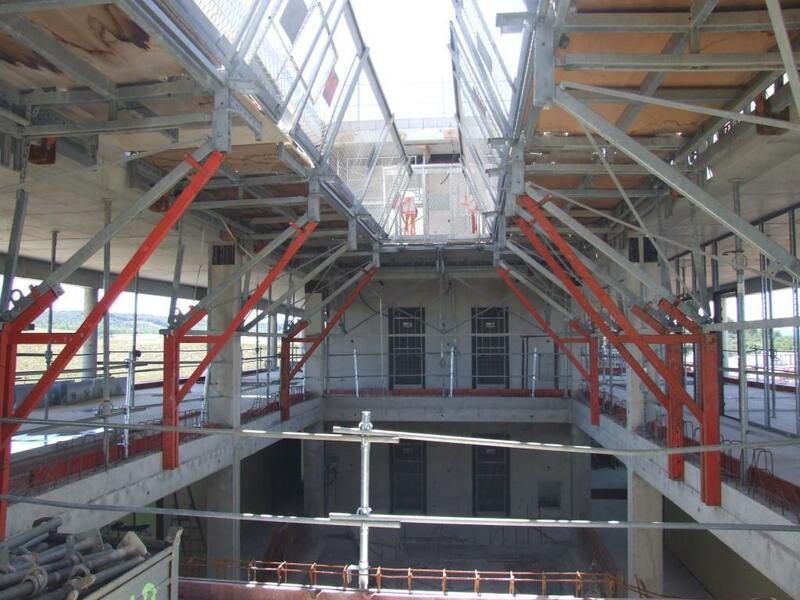 From the roof of the main building, it's easy to follow the progress of the Headquarters extension in March. 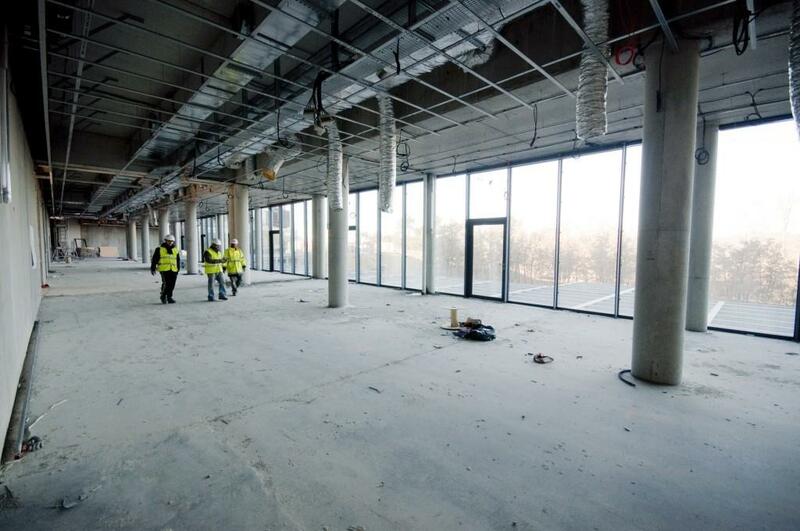 Work is underway on the first floor of the extension to Headquarters. 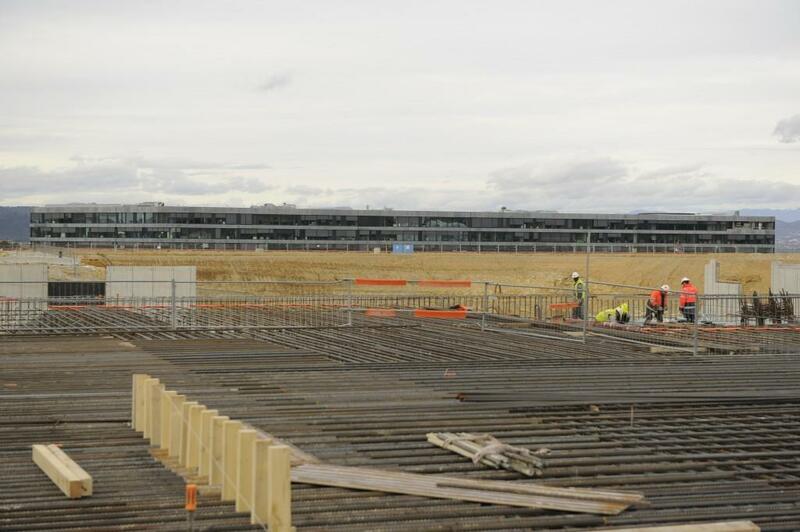 At a rate of approximately one storey every three weeks, the five-storey structure will be framed out by late May. 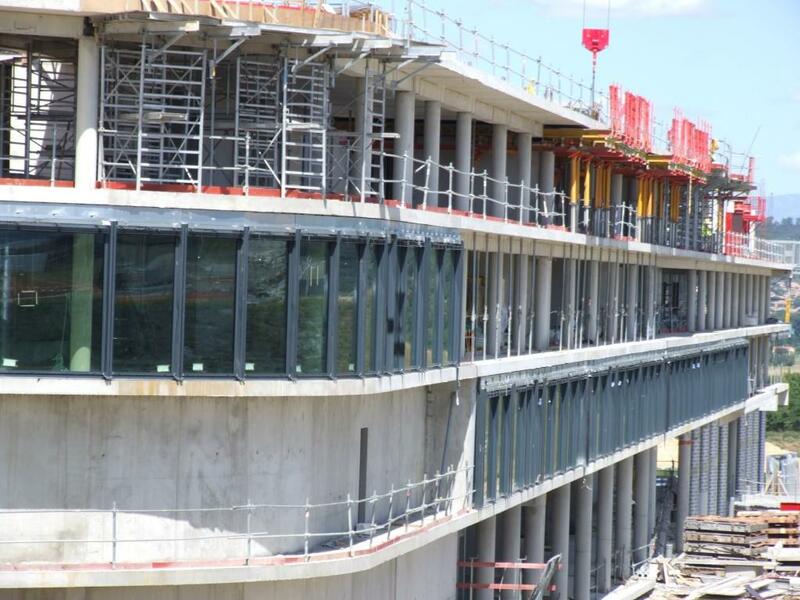 We can't see them yet, but soon the first-storey walls of the Headquarters extension will be visible from the platform. 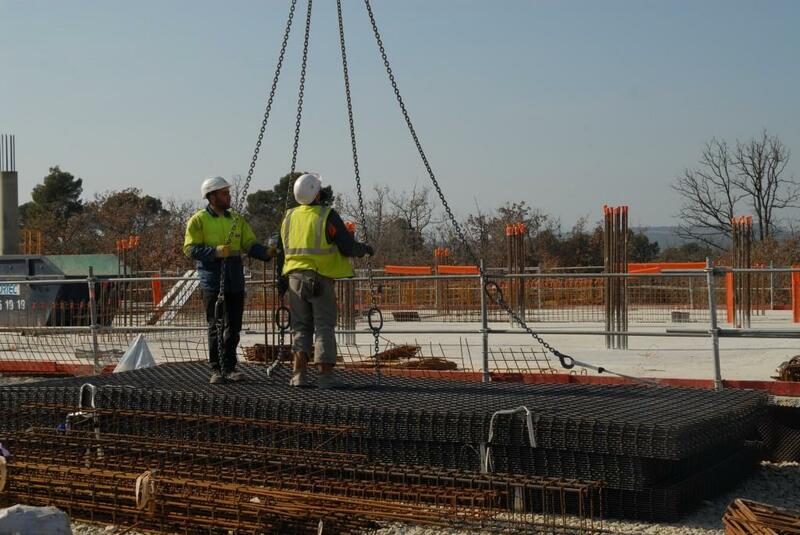 The concrete basemat for the 3,500 m² extension was poured on 30 January, marking the end of the foundation work phase. 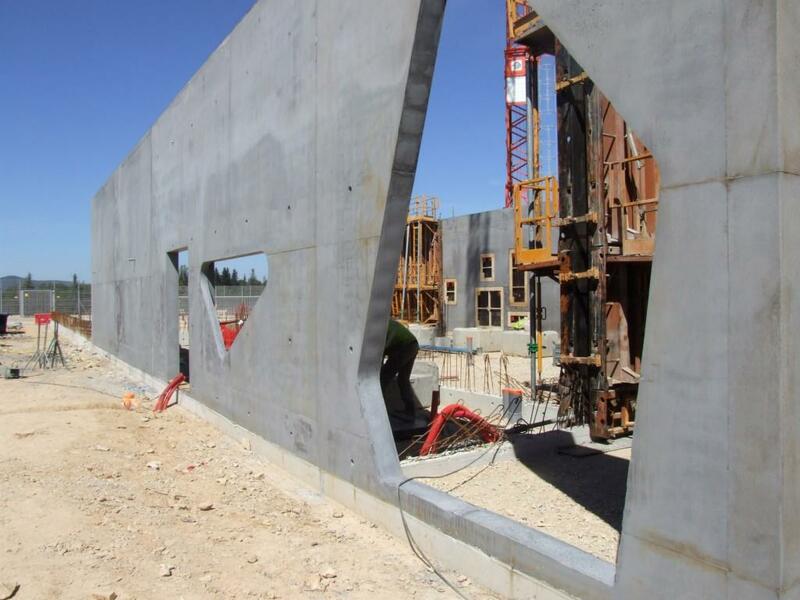 Work has begun on the walls; the complete exterior shell should be in place in June. 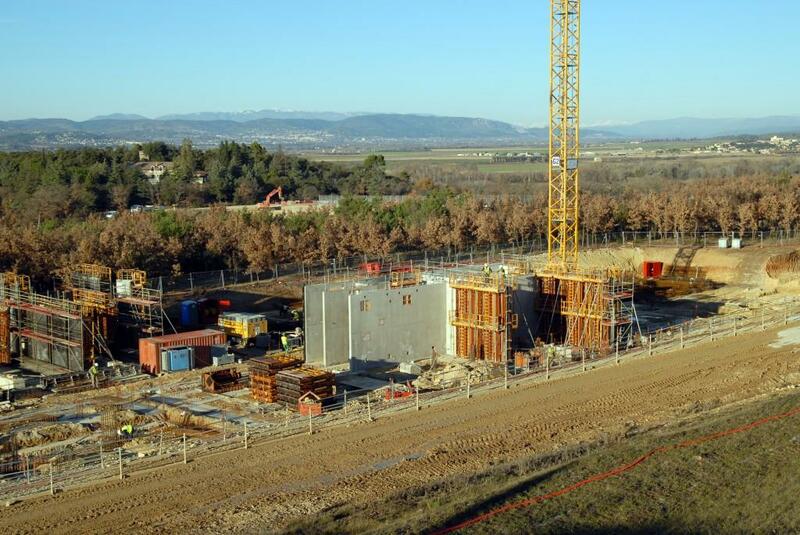 As the sun rises over the ITER site, the first employees arrive at their offices. 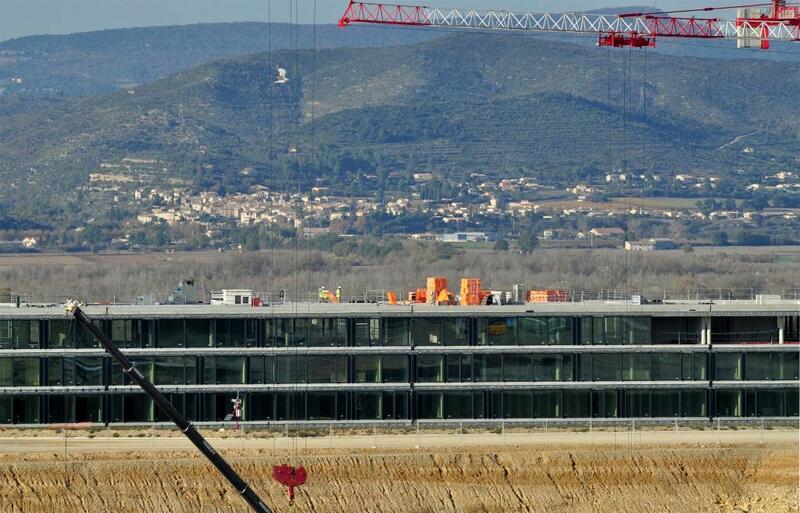 Regular shuttle buses run between ITER Headquarters and two other ITER office buildings ... with increased frequency at lunch time. 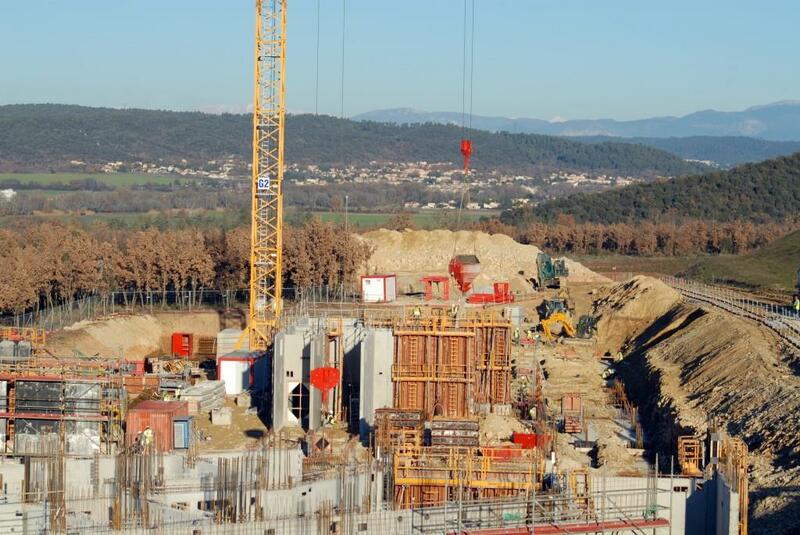 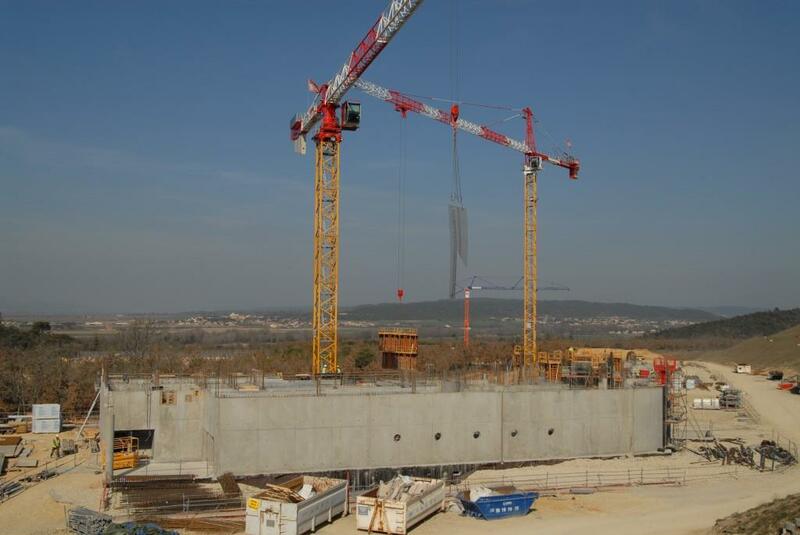 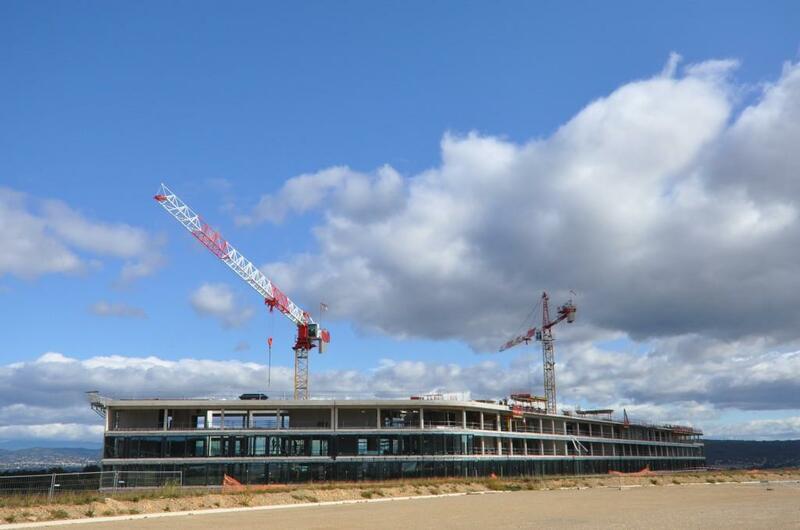 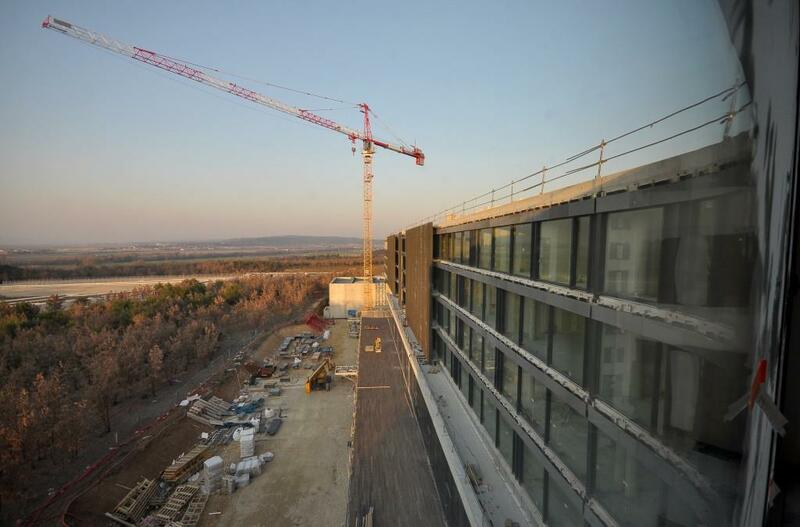 The top three storeys of ITER Headquarters have a view of construction works. 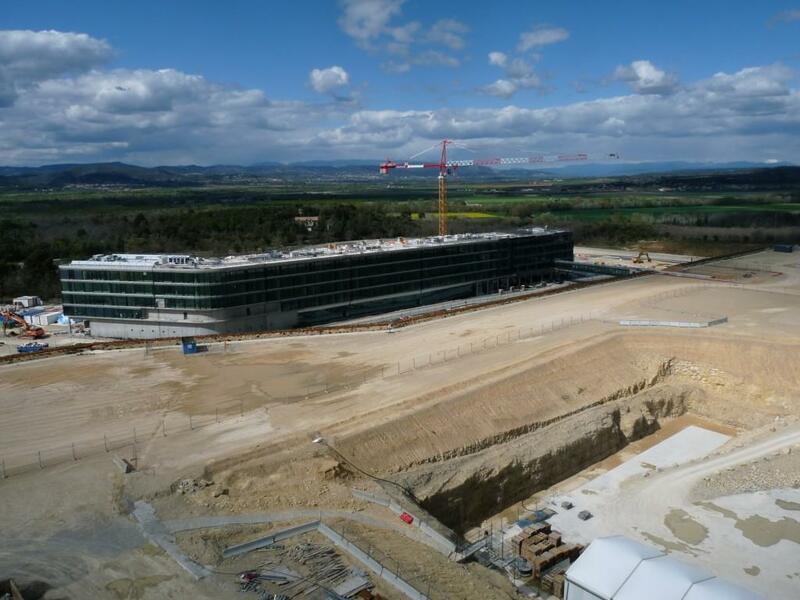 The ITER Headquarters, photographed in May between two storm clouds. 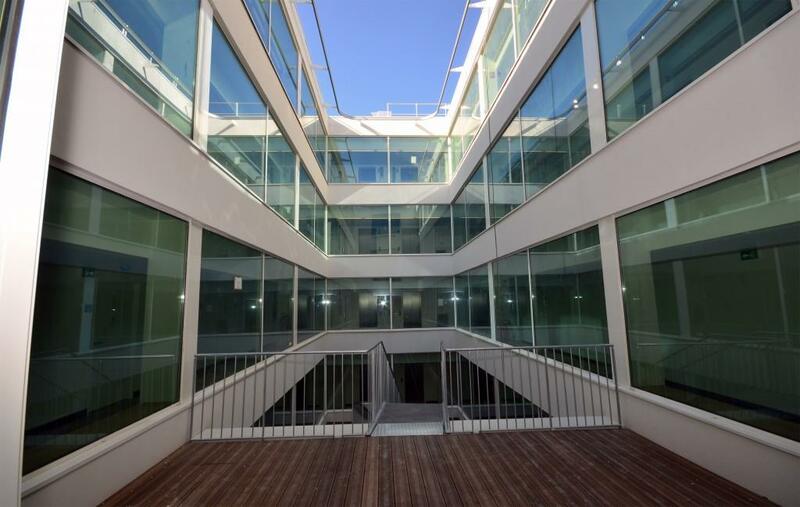 The northwest-facing cafeteria occupies the lower level of the building. 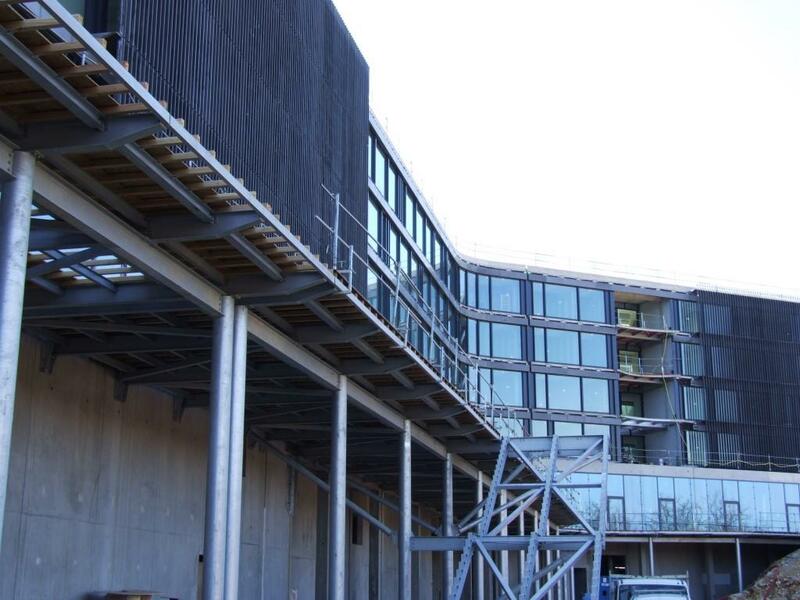 Contrary to the other side of the building, this end was left unfinished. 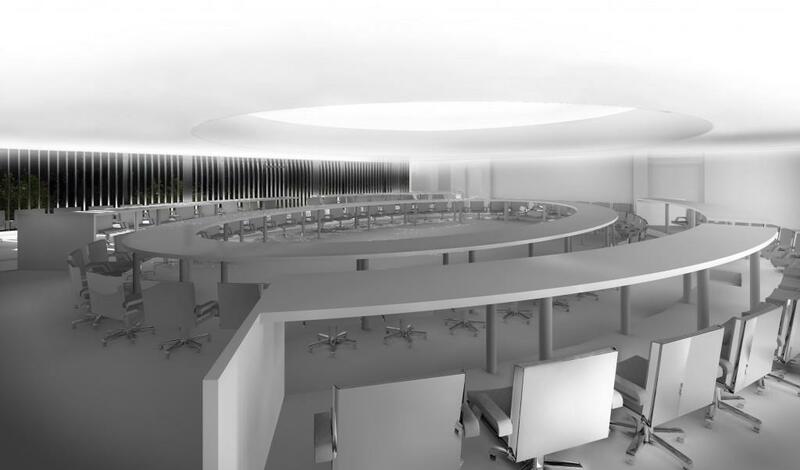 In 2013, work will begin to extend the building by 35 metres for an additional 350 desk spaces. 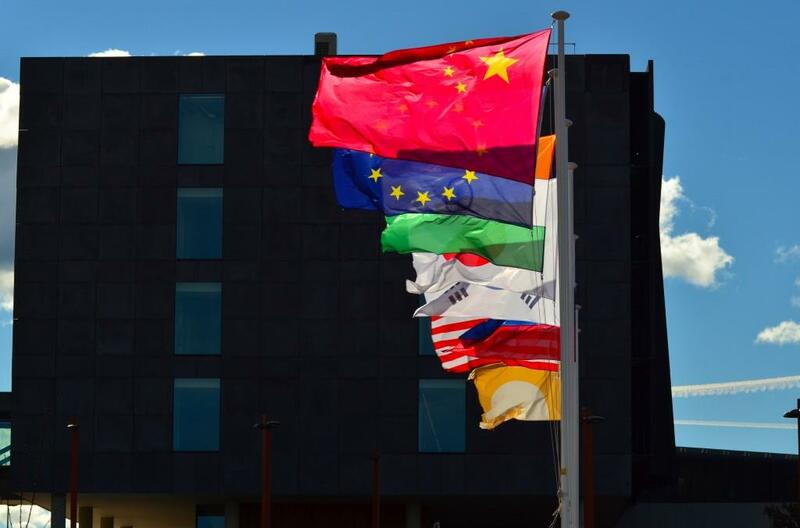 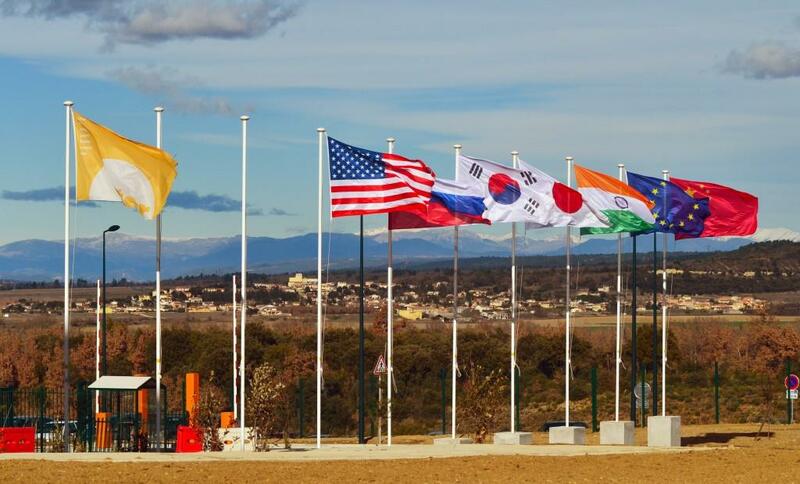 At the entrance of the new ITER Headquarters building, flags from the seven ITER Members and the yellow flag of the ITER Organization unfurl in the early February wind. 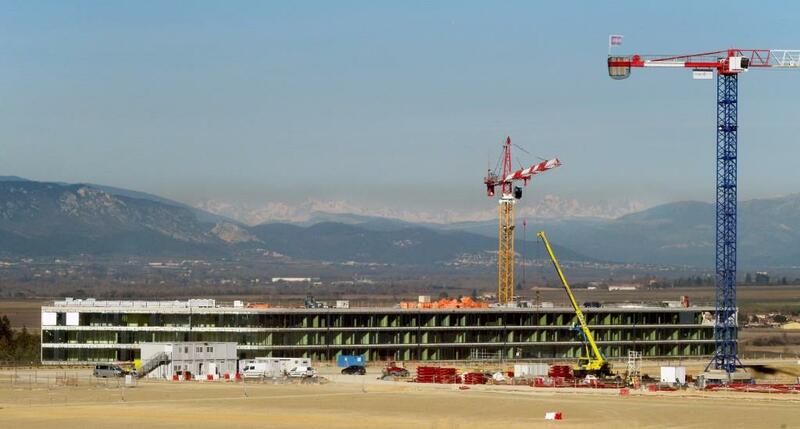 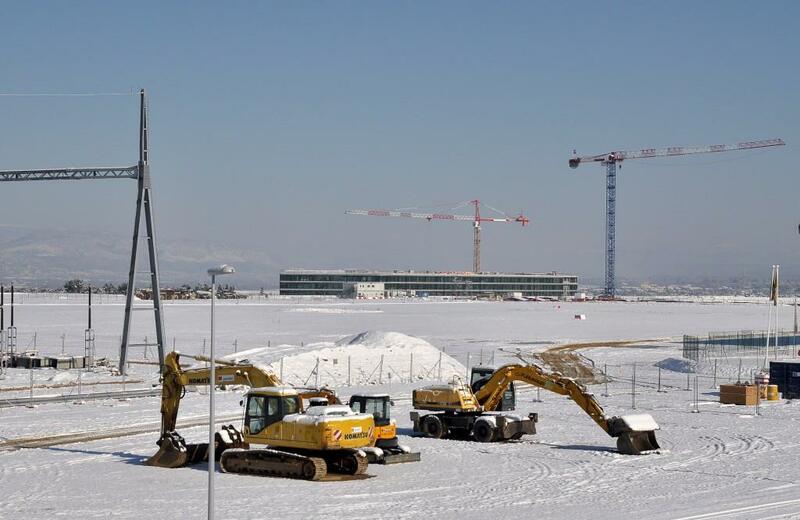 On a brisk day in February, the ITER Member flags stand proudly against a backdrop of snow-covered mountains. 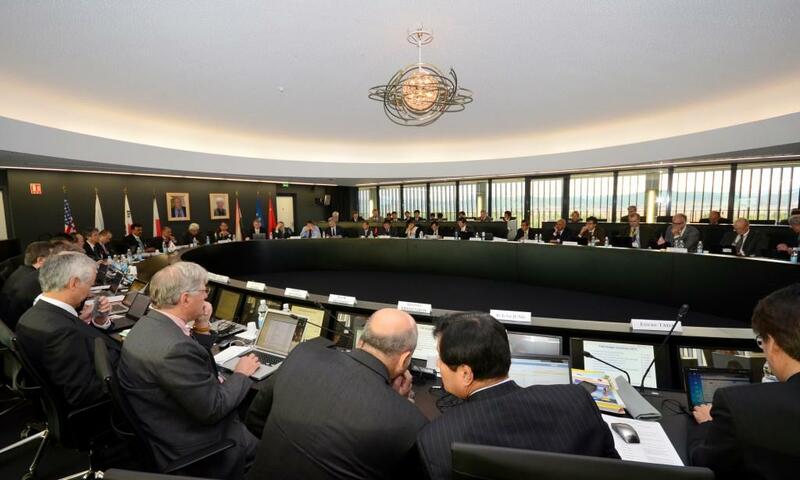 In the completed Headquarters building, the ITER Council meets for the first time in the fifth-floor Council Chamber. 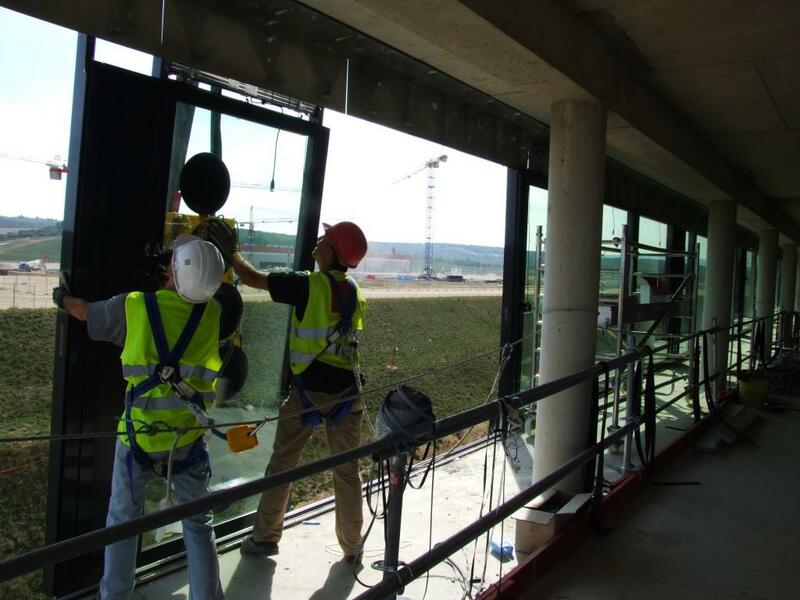 Before the Eleventh ITER Council convenes from 28-29 November 2012, the Council Chamber undergoes a last round of waxing, window washing and equipment testing. 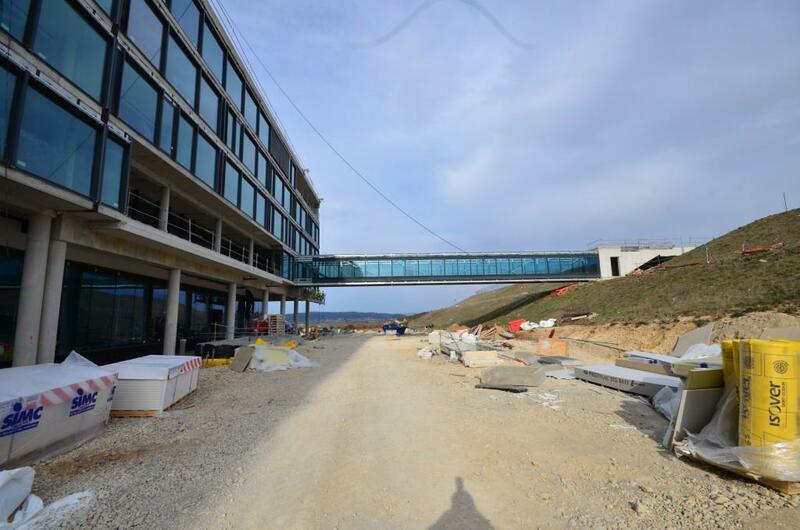 They are ready to welcome you! 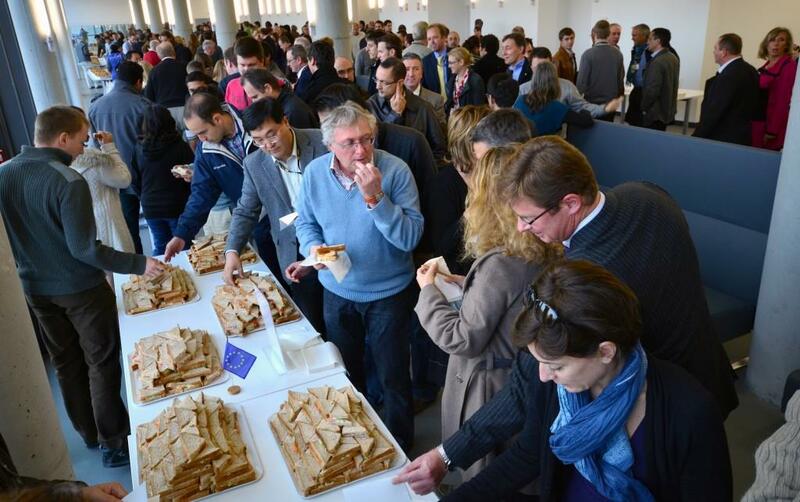 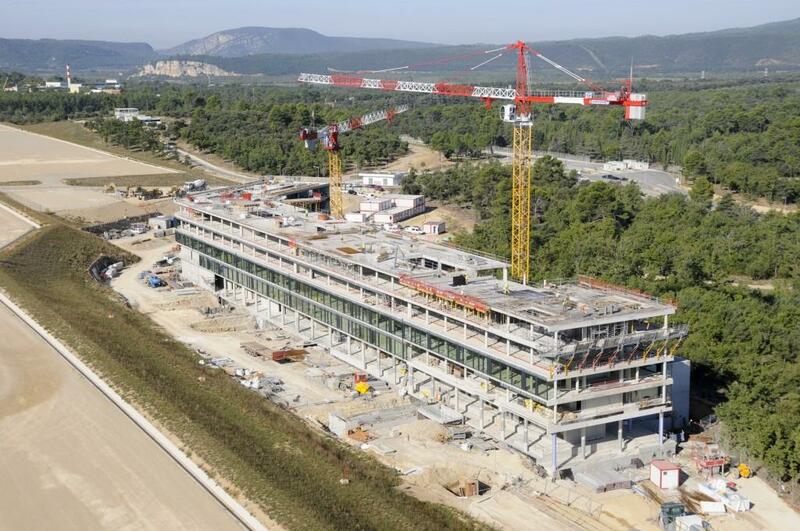 An average of 90 people visit the ITER Headquarters every day. 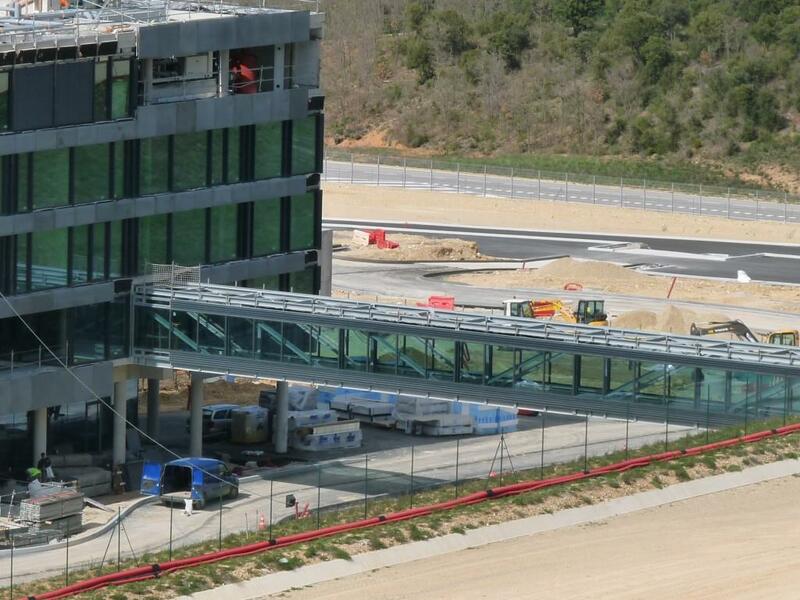 First stop: the Access Control building, pictured. 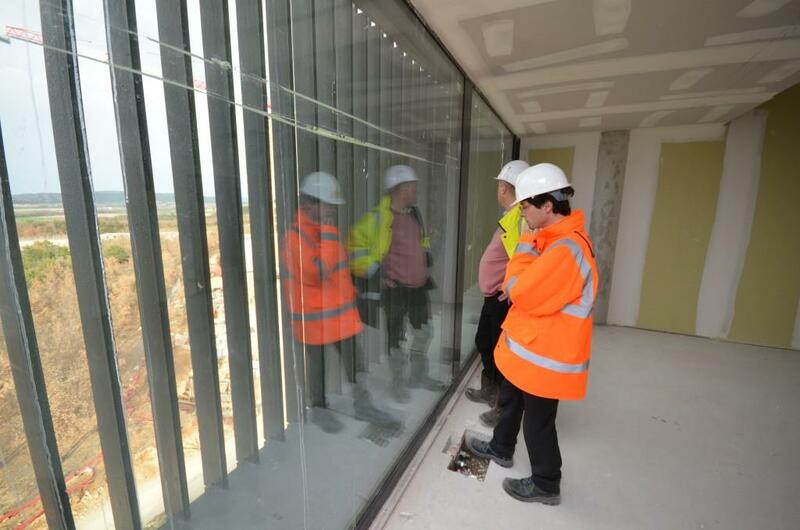 From the fifth floor of the building, it's possible to take in the entire 42-hectare construction site. 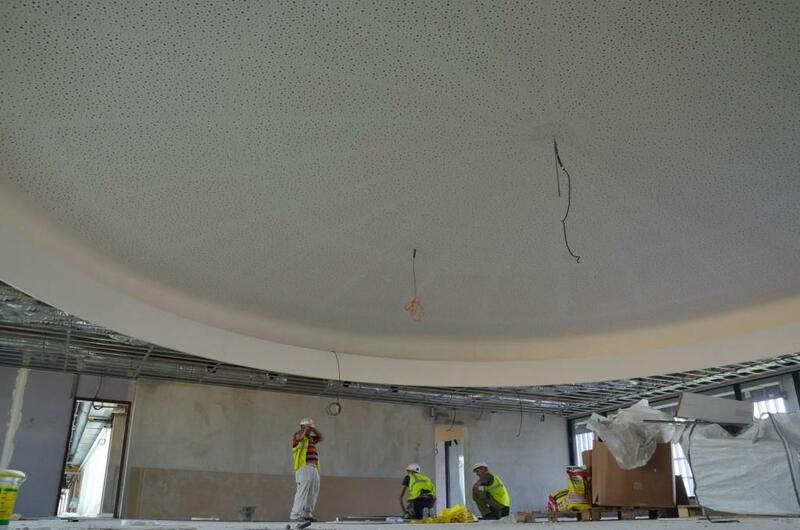 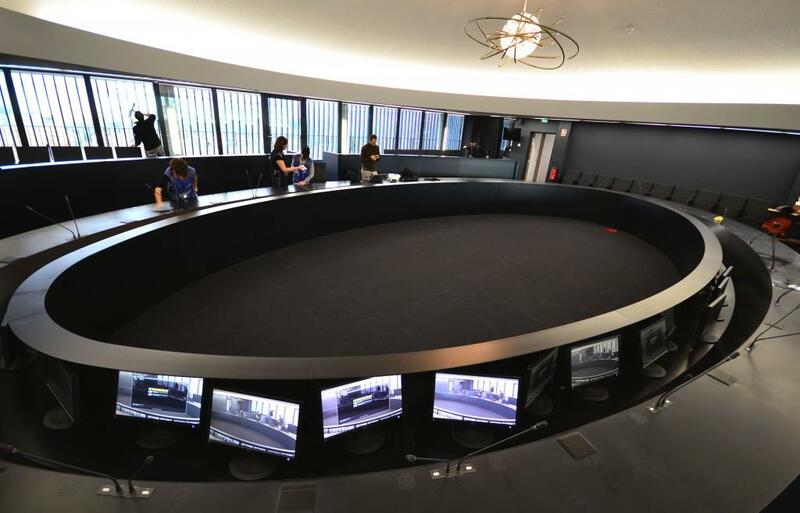 There's just about one month left to complete the Council Room, before the ITER Council invests the space to convene its eleventh meeting on 28-29 November 2012. 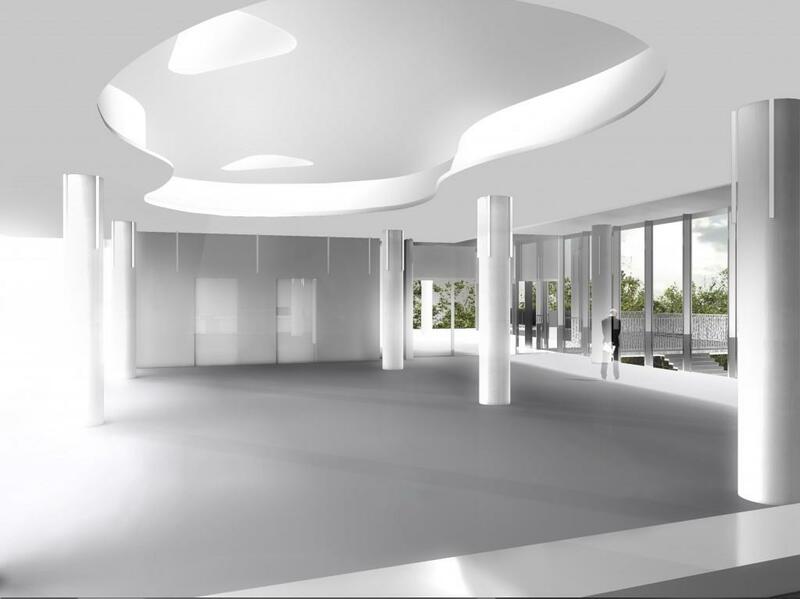 Sun pours into the lobby of the Headquarters building on Moving Day in October. 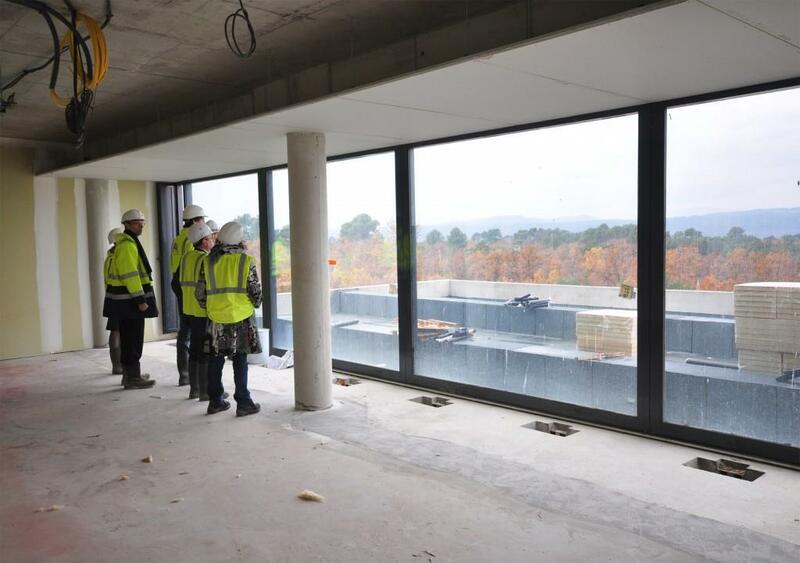 "A view needs to be framed"
Looking out of one of the north-facing offices. 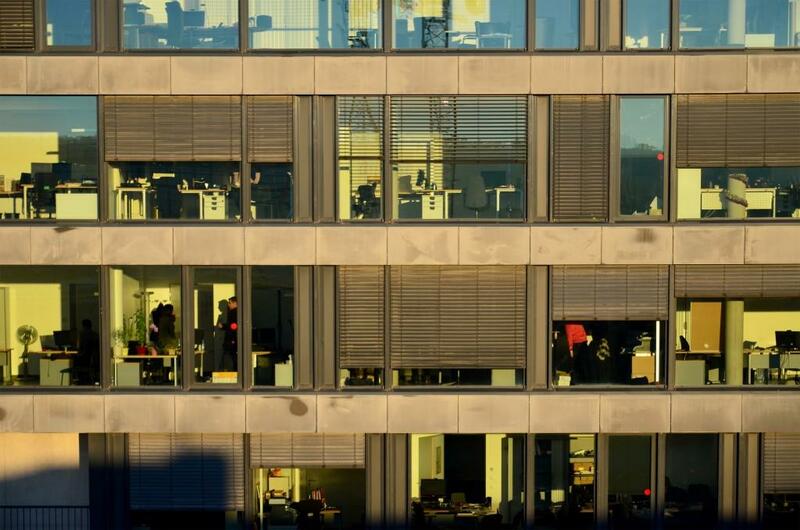 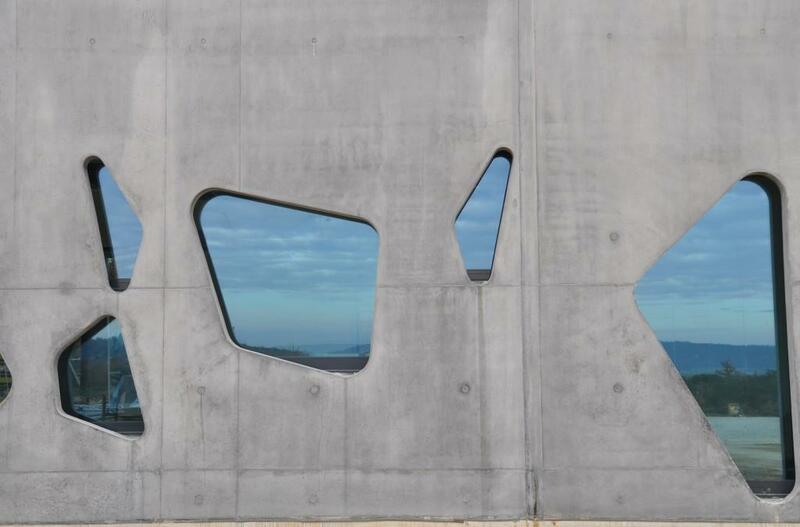 According to architect Laurent Bonhomme, who paired with colleague Rudy Ricciotti from Marseille to design the office building, as with a painting or a photograph, "a view needs to be framed"—especially in an office setting where concentration is important. 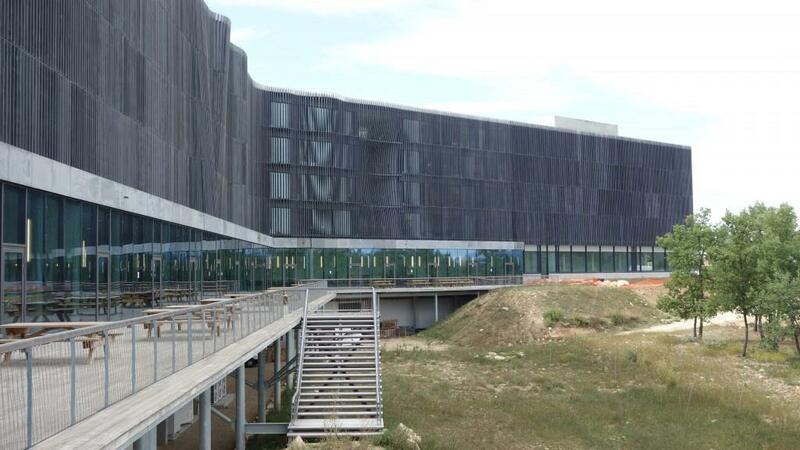 The undulating northwestern facade of the ITER Headquarters building faces the road. 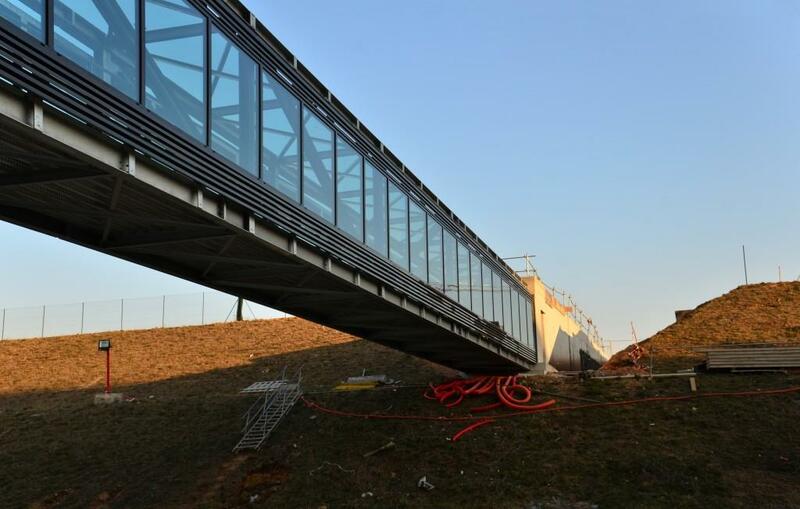 Take a tunnel to work? 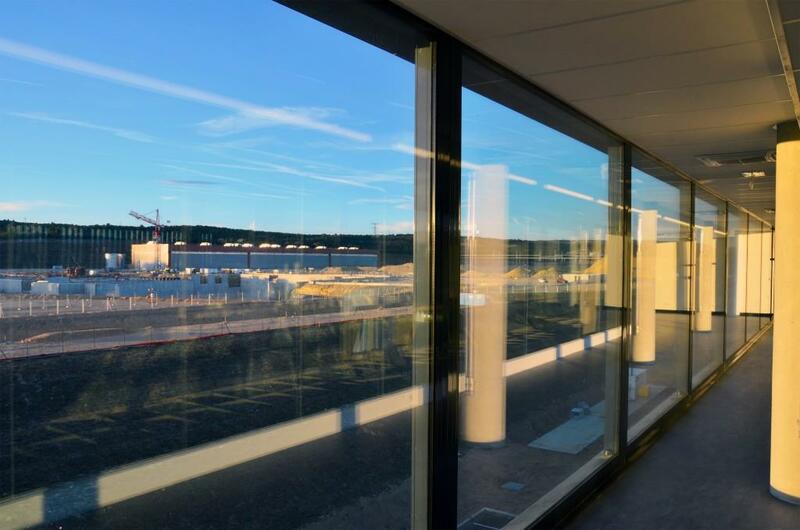 From the second floor of the completed Headquarters building, scientists will have access to the Control Room of the ITER Tokamak. 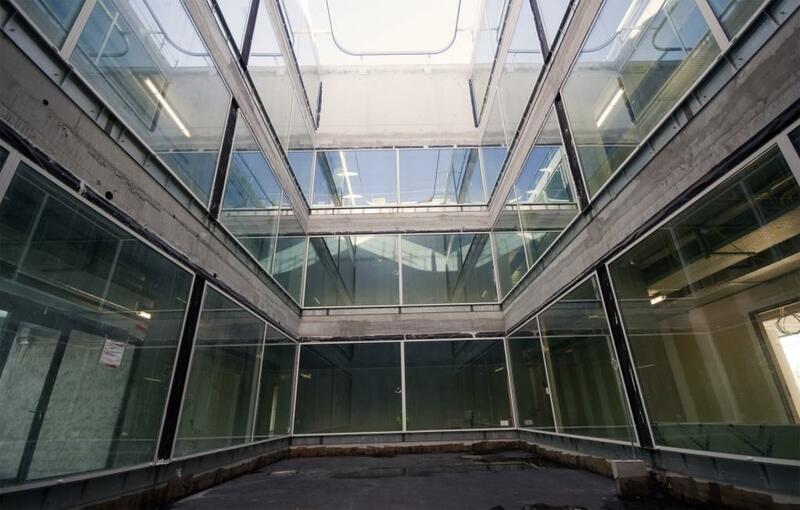 Glass predominates throughout the structure, on both the interior and exterior walls. 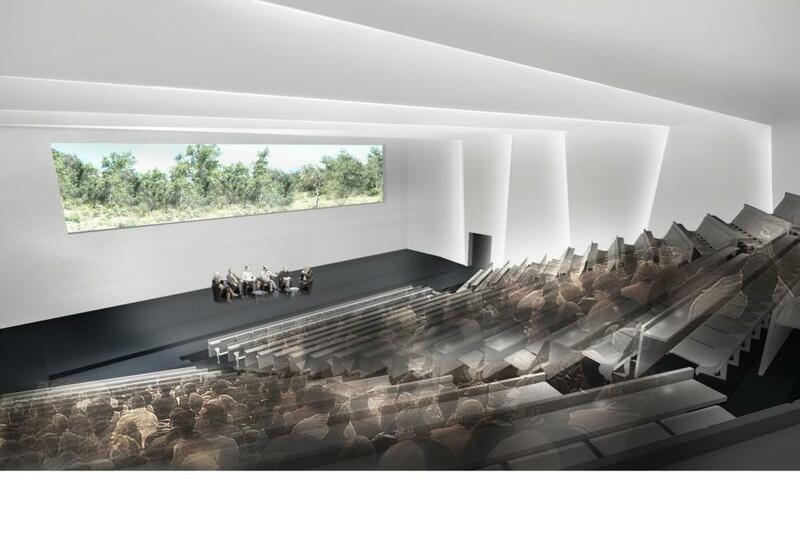 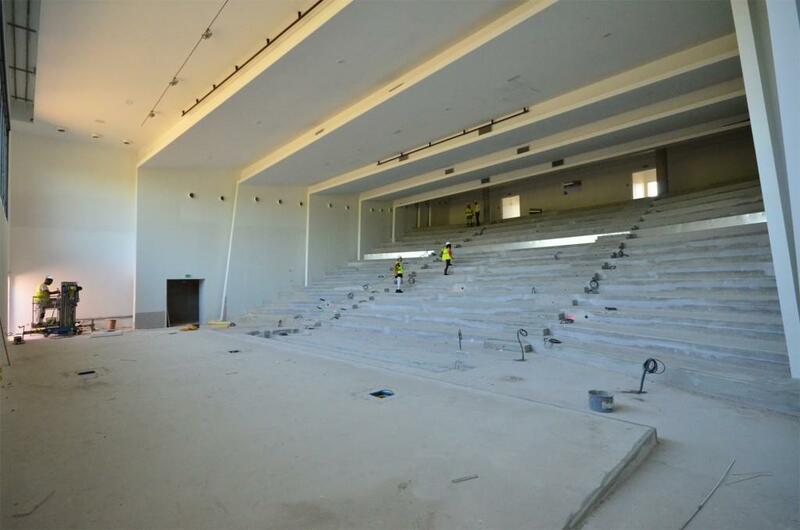 Furniture, carpeting and audiovisual equipment complete the 500-seat amphitheatre in September. 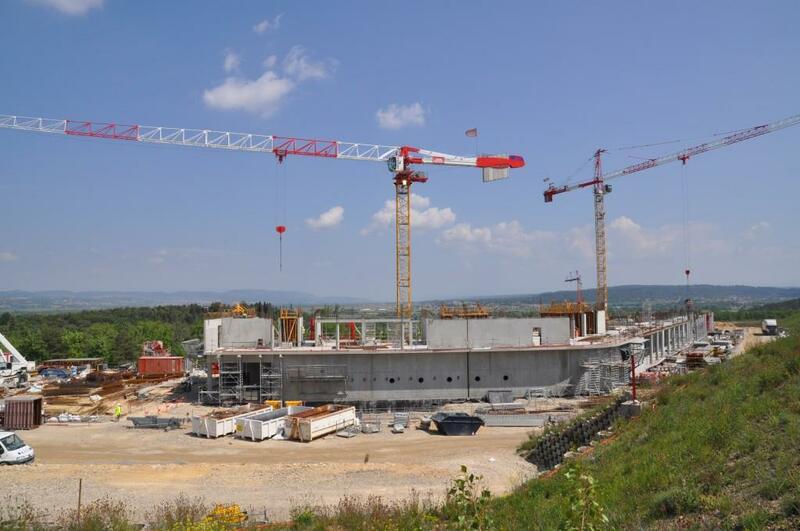 As the dog days of summer come to an end, the ITER Headquarters building prepares for Moving Day, scheduled in October. 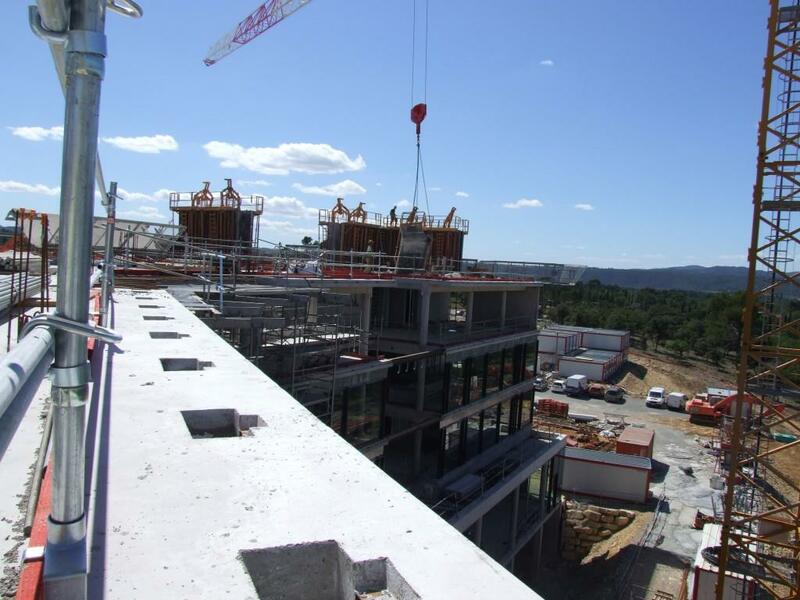 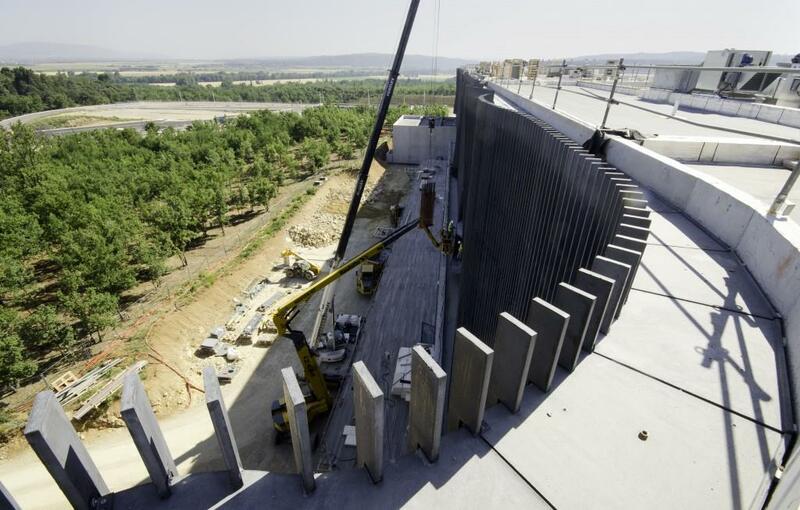 Above the ITER cafeteria, workers install the last vertical slats on the top four storeys of the building. 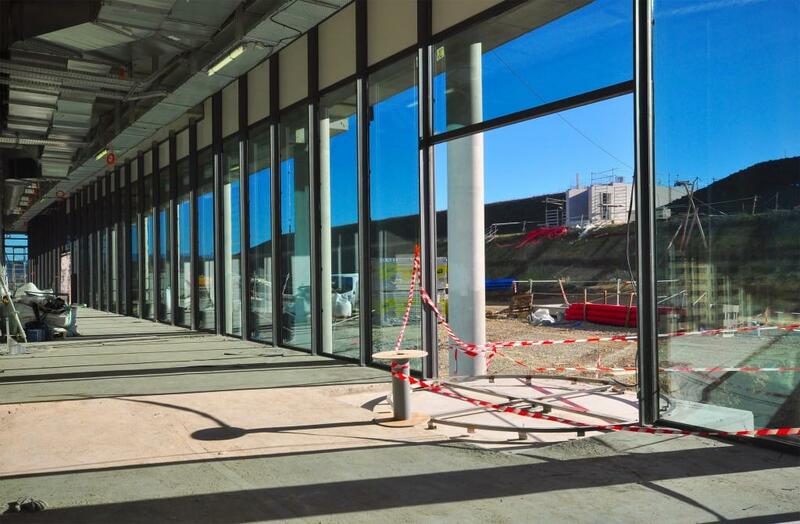 One hundred and eighty metres long, the Headquarters building is situated on the northwest corner of the platform. 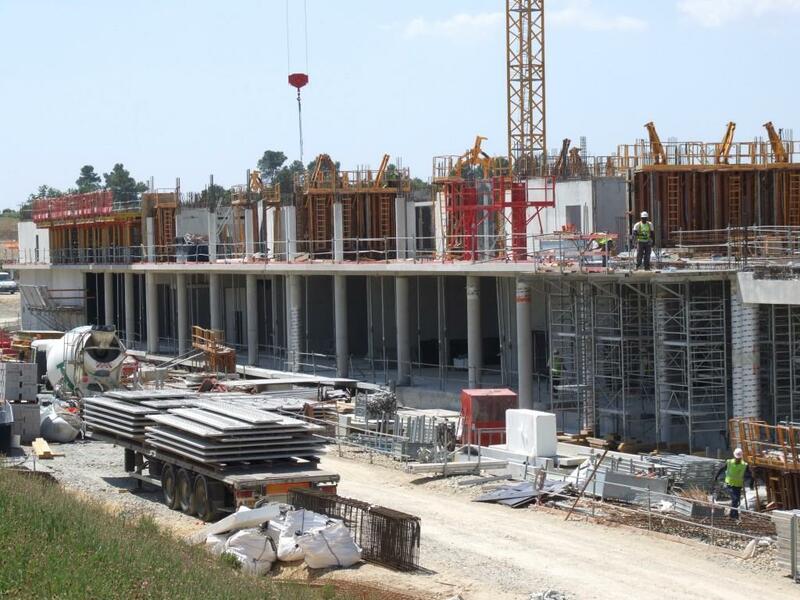 The building will be ready for delivery in two months. 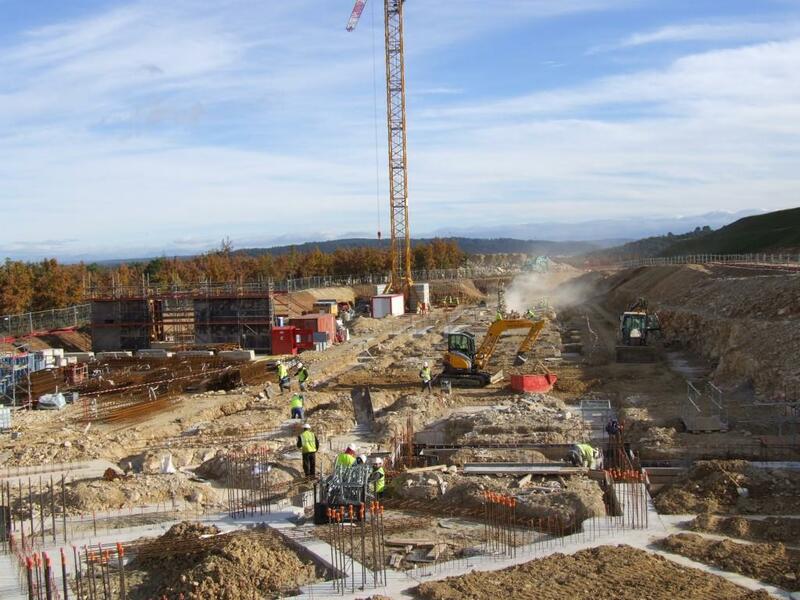 Staff will badge in here, at the Site Access Control Building, before following the path to ITER Headquarters. 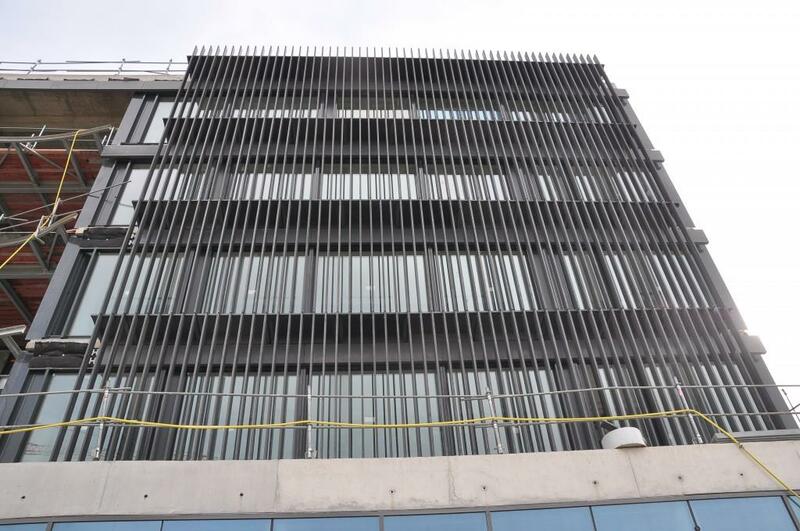 From the roof, looking down toward the cafeteria terrace, it's easy to see how the architectural slats are mounted all along the building's northwest face. 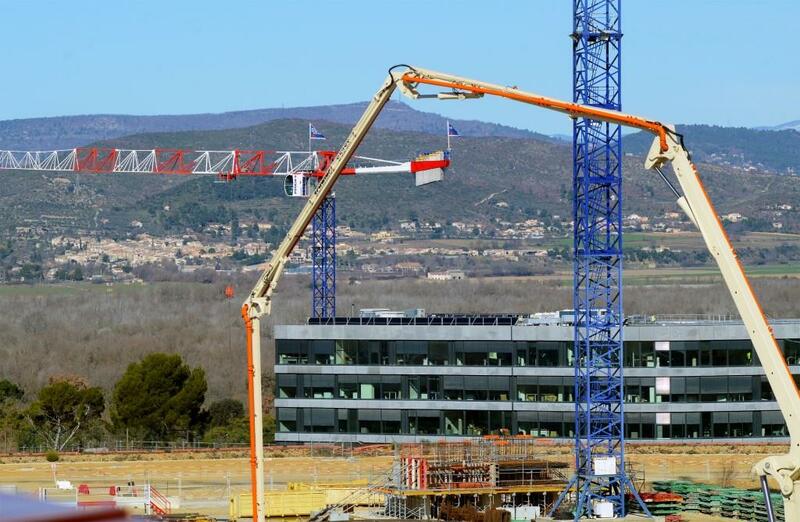 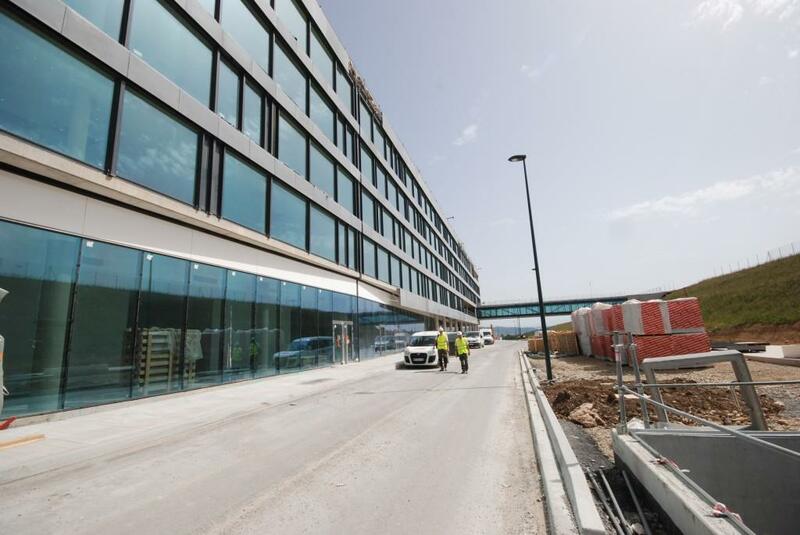 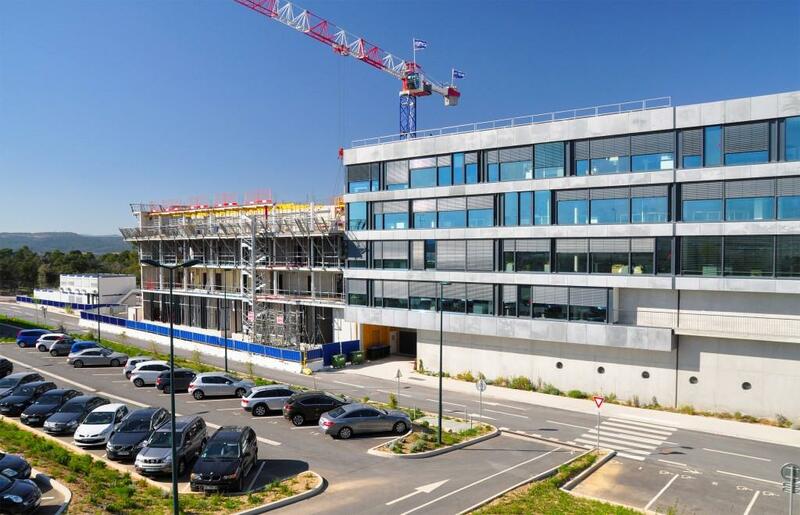 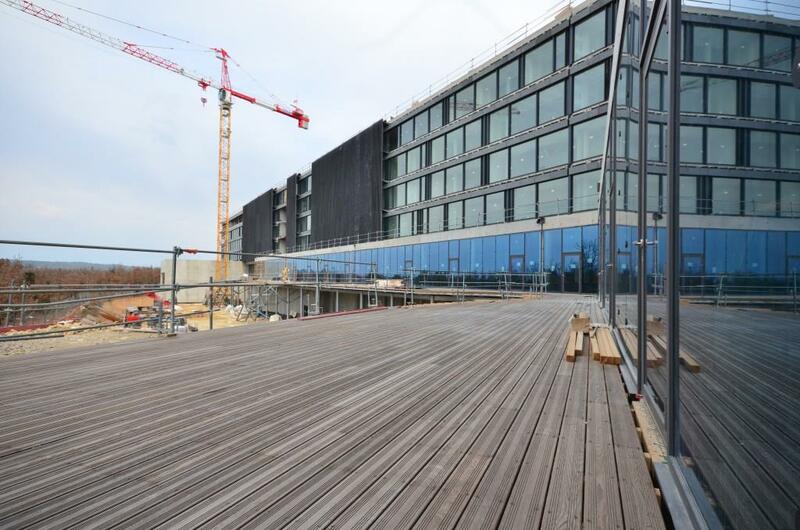 Light shafts are foreseen all along the 180 metres of the new ITER office building—some 3-storey (pictured), some 5-storey. 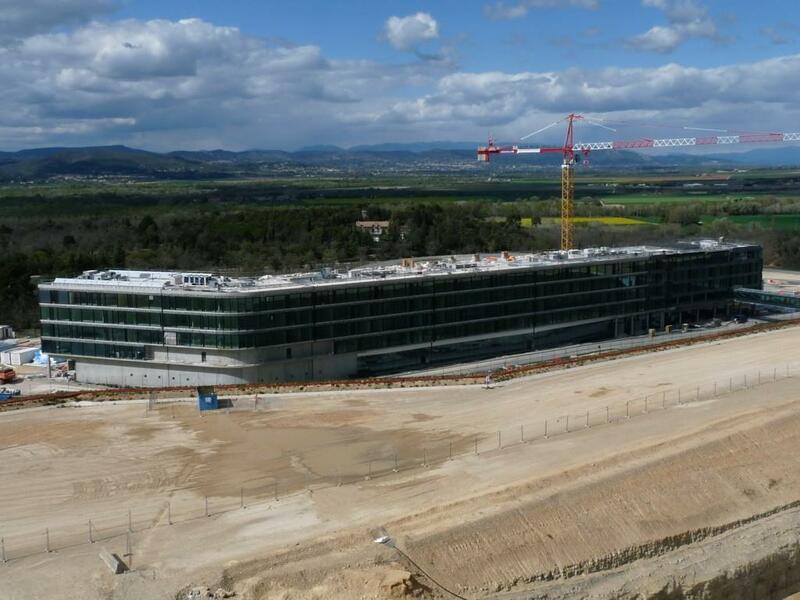 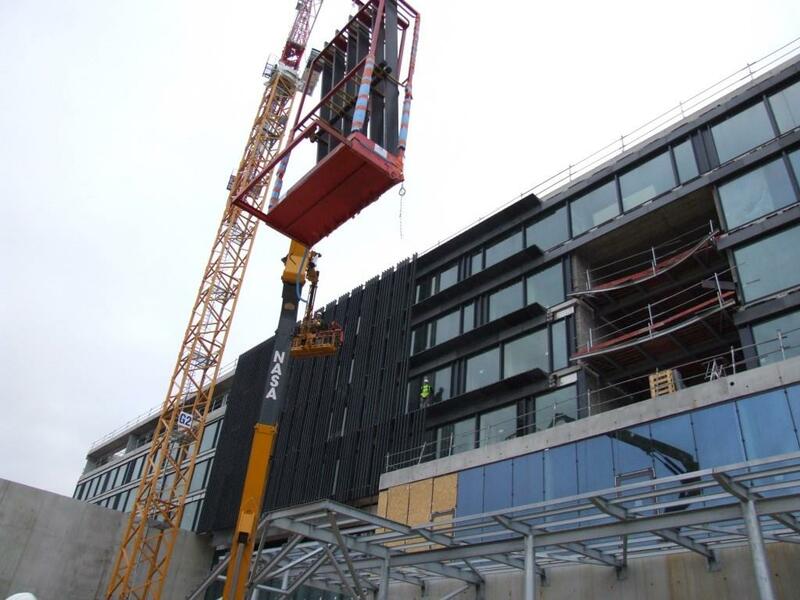 Following the installation of the last glass windows in November, the stage is set for the immense vertical slats that will adorn the northern facade of ITER Headquarters. 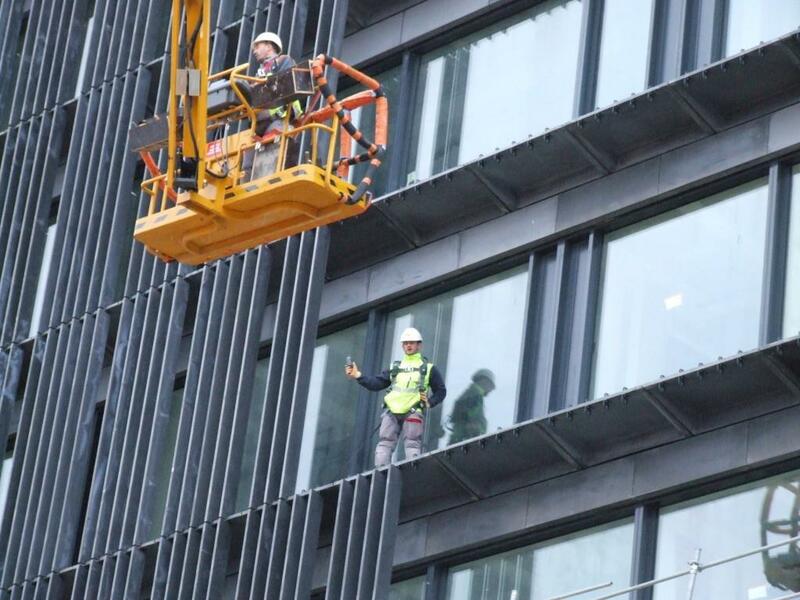 Over 3,000 of these slats will create an external veil 14 m high and 180 m long. 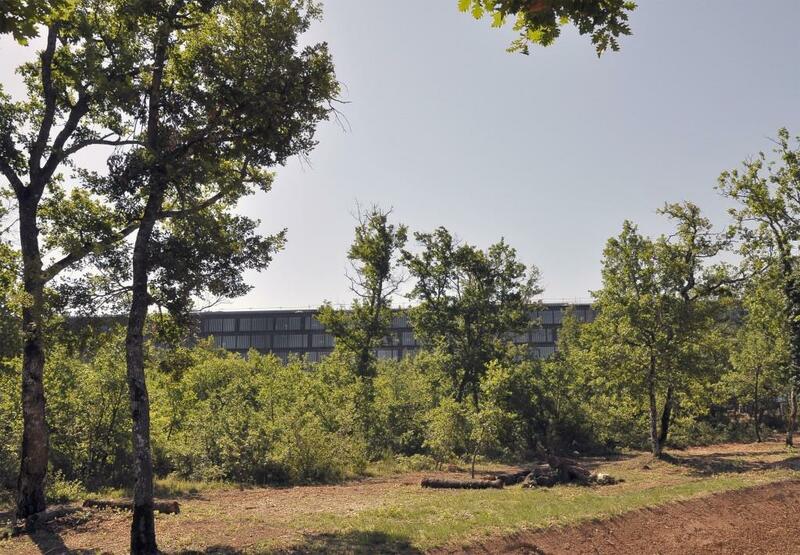 The Headquarters cafeteria is situated at the back of the building, with a terrace overlooking a wooded parcel. 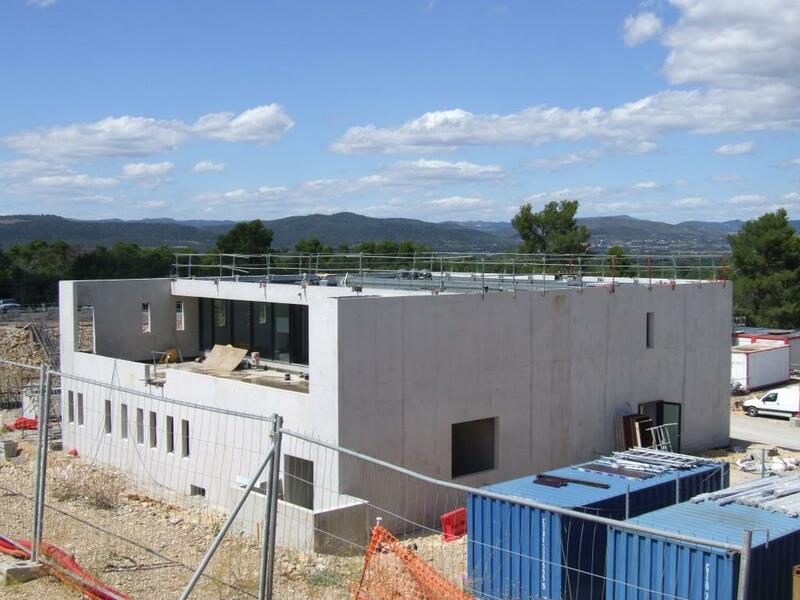 The near-completed ITER Headquarters building is visible from the road between St-Paul-lez-Durance and Vinon-sur-Verson. 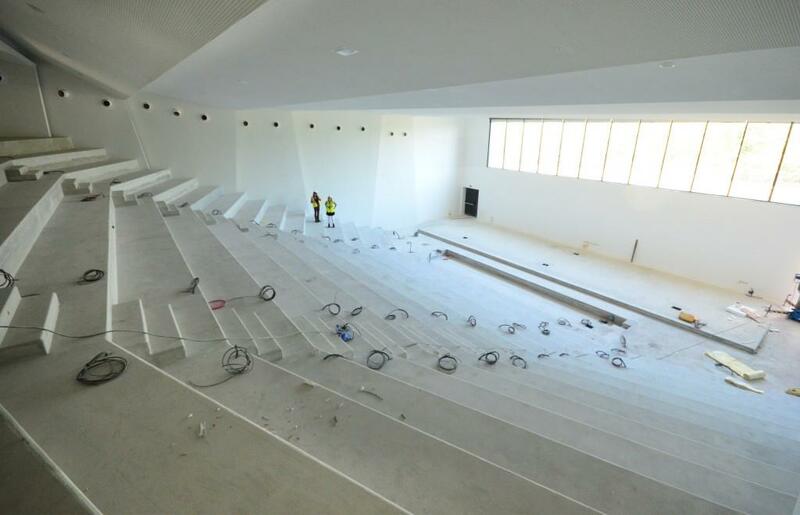 Only the furniture is missing in the 500-seat ITER amphitheatre. 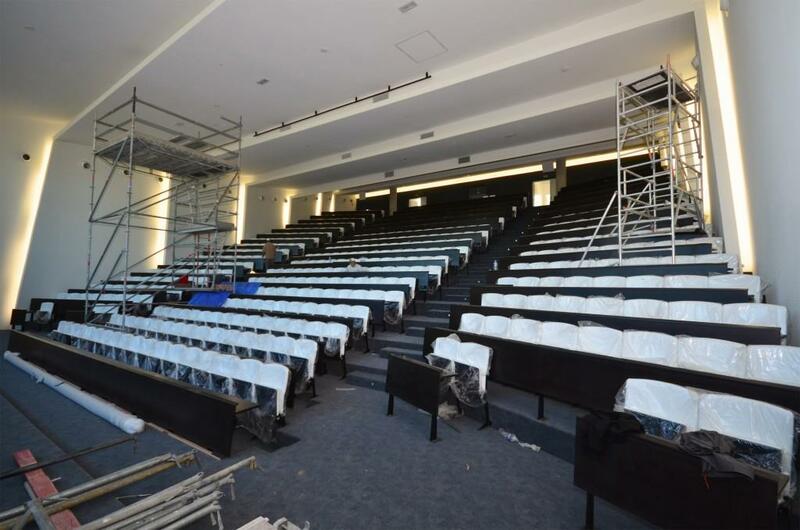 Staff will enter on the ground floor, through doors (upper right) situated just a step away from the lobby entrance. 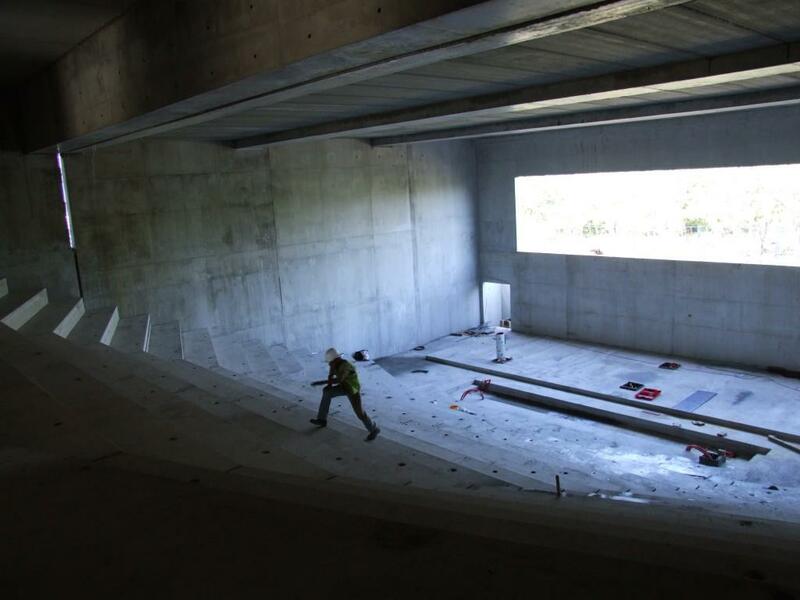 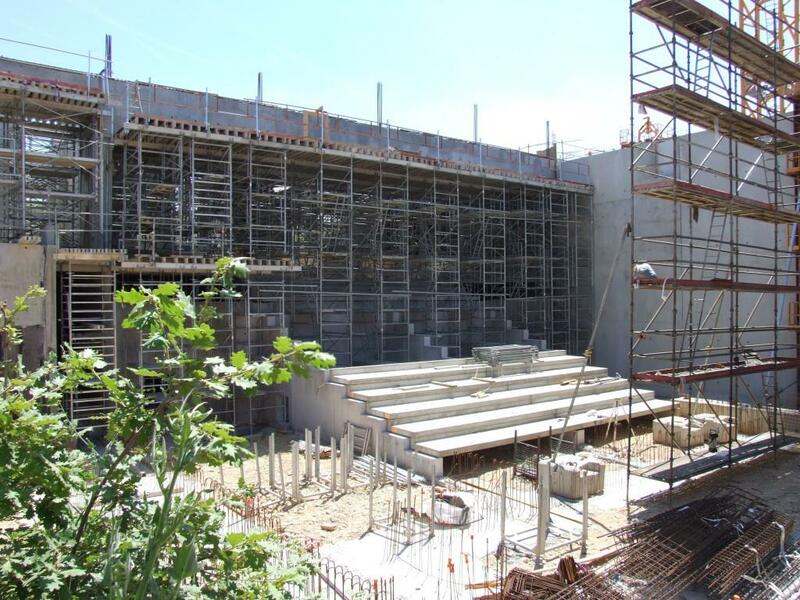 The amphitheatre in the new building will provide ITER staff with the opportunity to assemble in one room—something that had been impossible in the temporary offices the team has occupied since 2006. 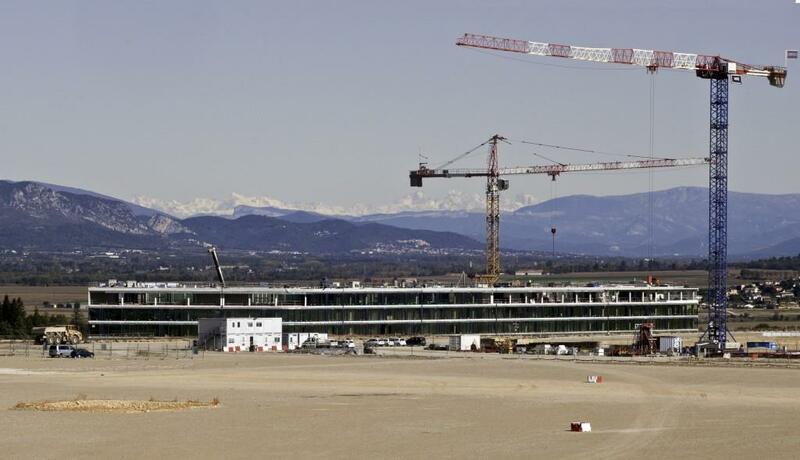 Looking over the near-completed Headquarters building toward the pre-Alps. 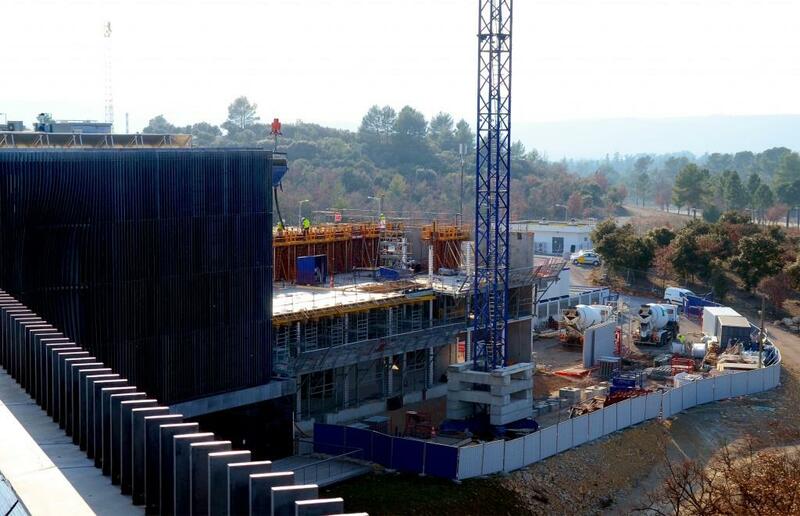 The ITER Headquarters building sits below the platform; some of the upper offices will look out directly onto the ITER laboratory. 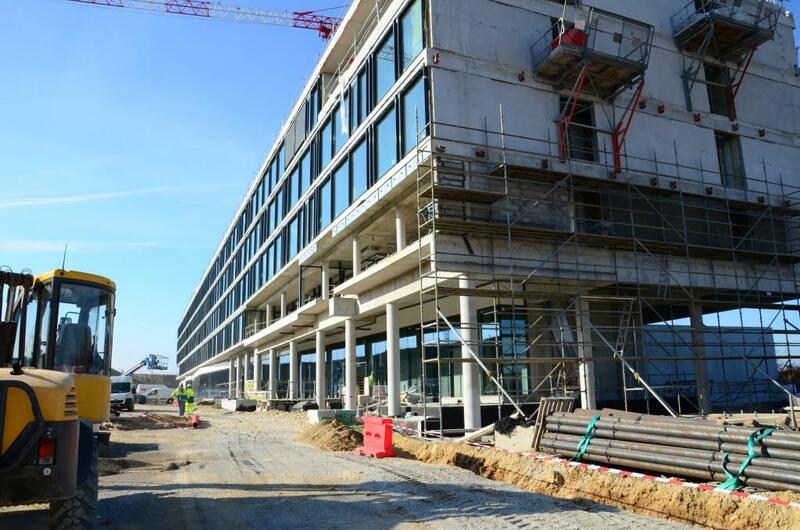 The superstructure of the Headquarters building was finished in September 2011. 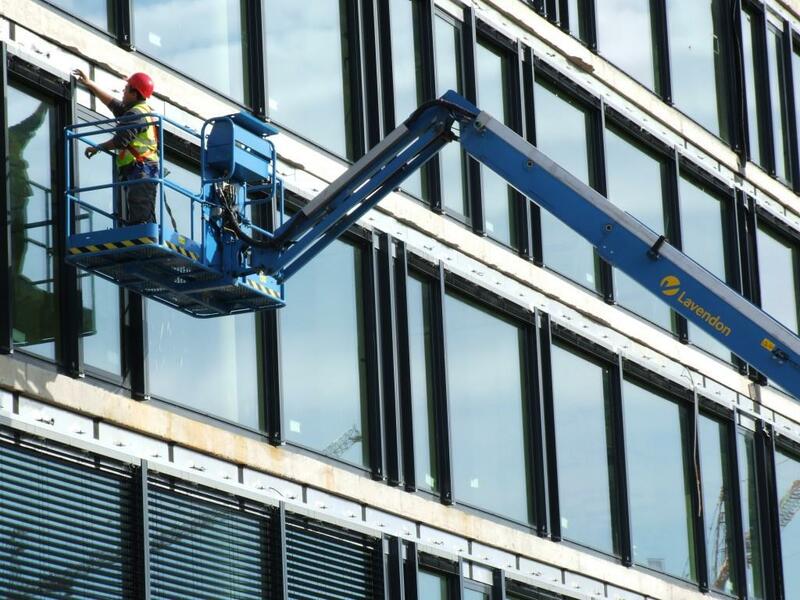 Since this date, workers have been equipping the interior of the building. 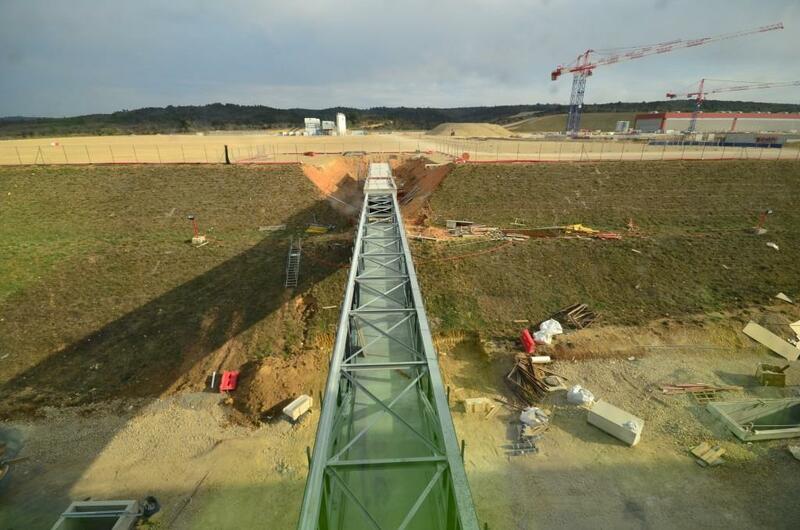 Looking down onto the walkway, then tunnel, that leads to the area on the ITER platform where the Control Room will be located in a few years. 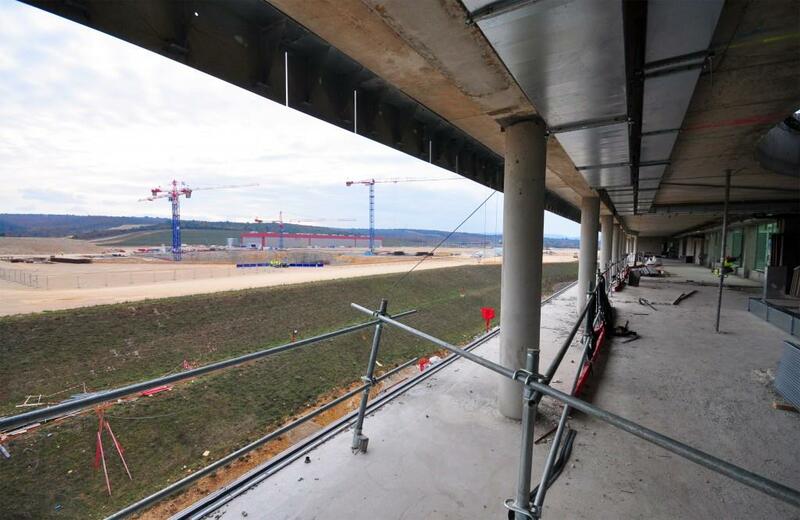 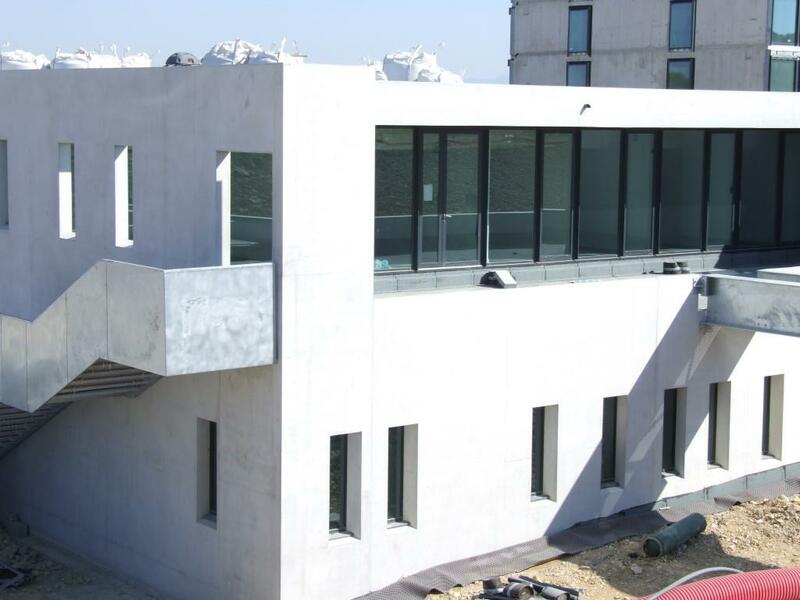 The ITER canteen on the ground floor will have its own outside terrace. 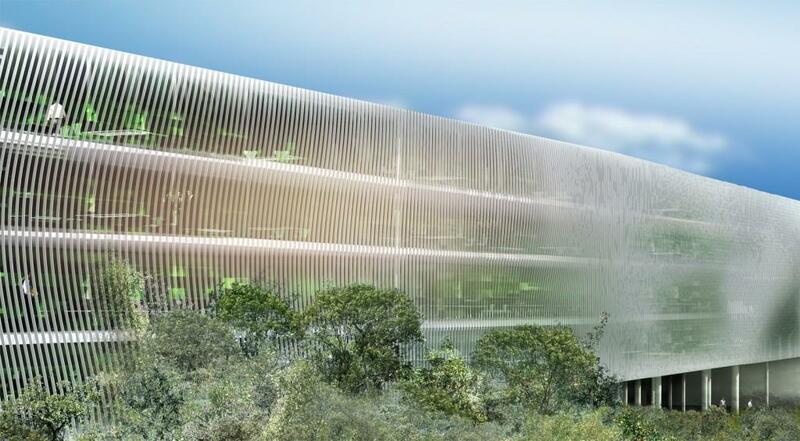 What will it be like cohabitating with the architectural slats? 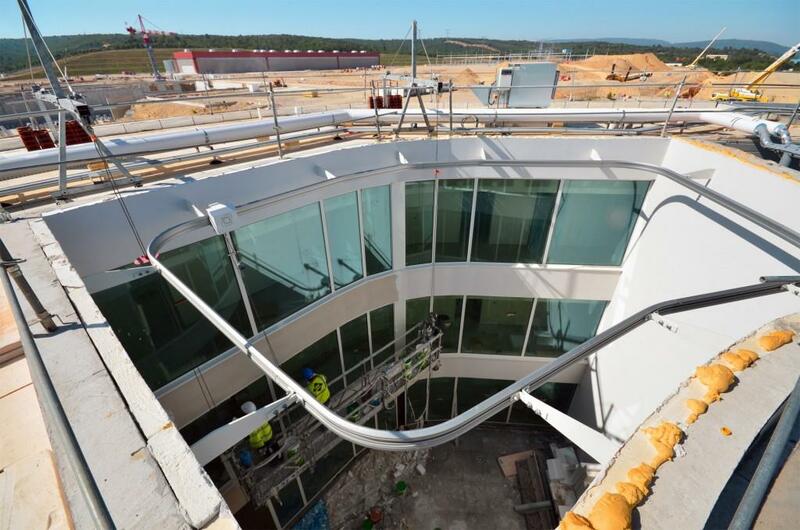 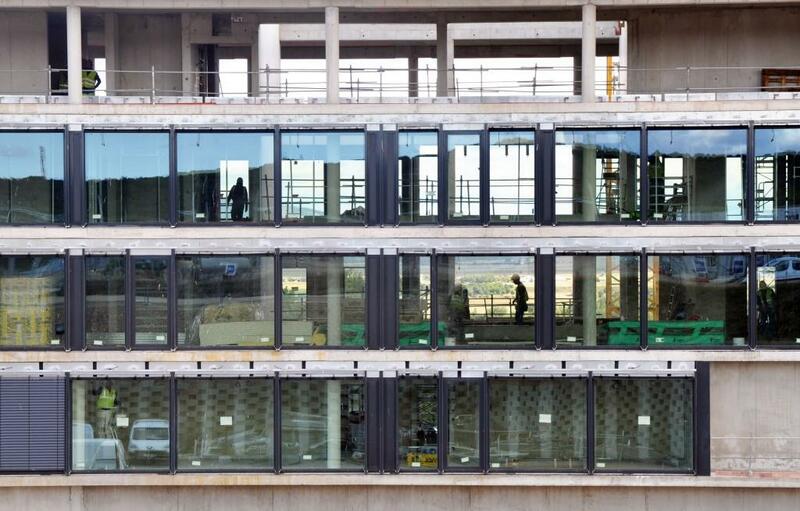 Windows and a glass ceiling have been installed on the footbridge that links the ITER offices to the Control Room on the platform. 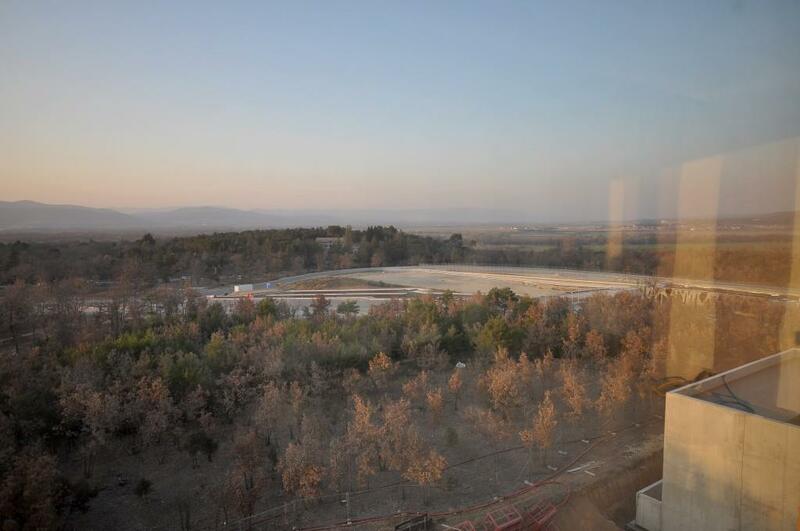 Looking north from an office on the top floor. 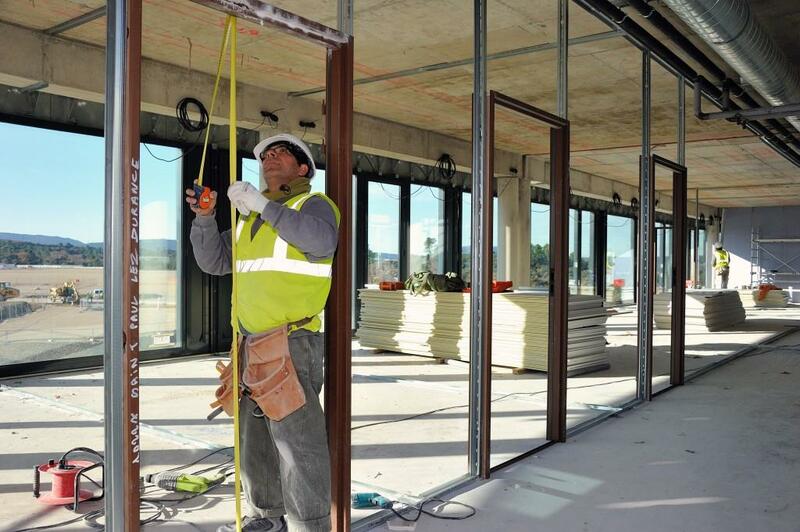 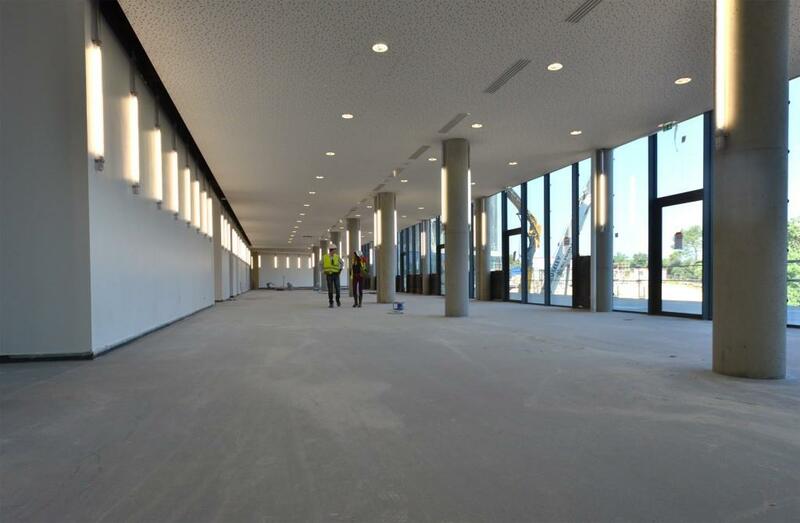 On the inside, workers are installing some 12,000 square metres of dividing walls to shape out the offices. 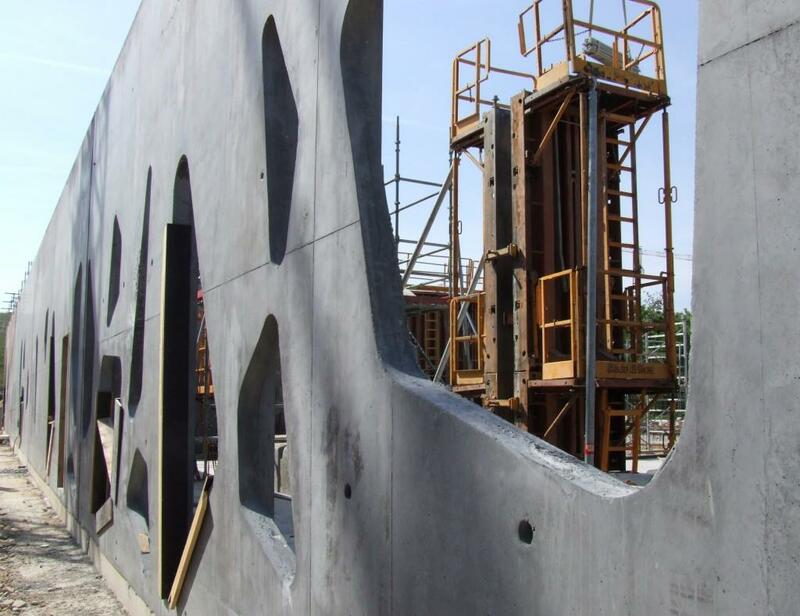 On the outside, work continues on the "exterior veil." 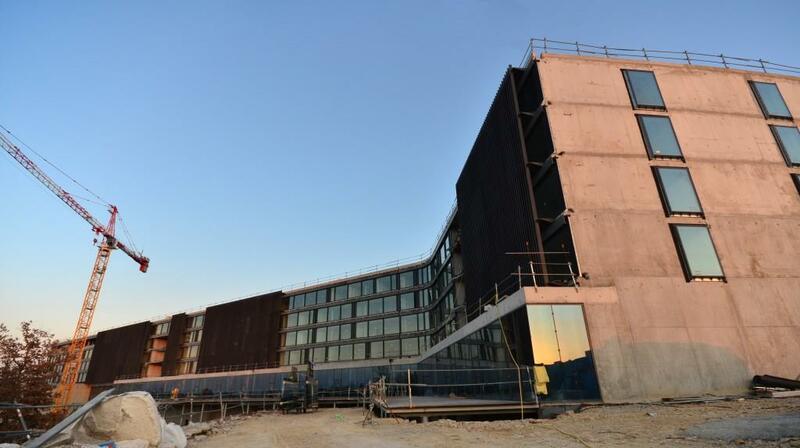 The late-day sun illuminates the western facade of the ITER Headquarters. 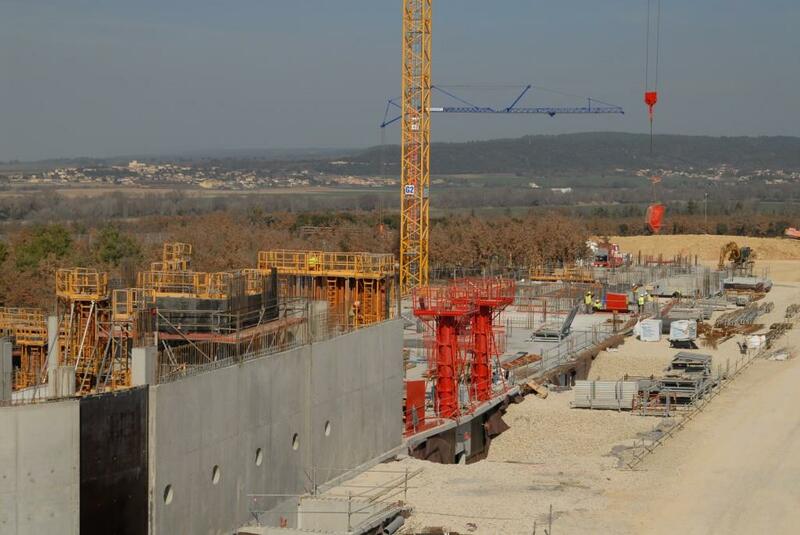 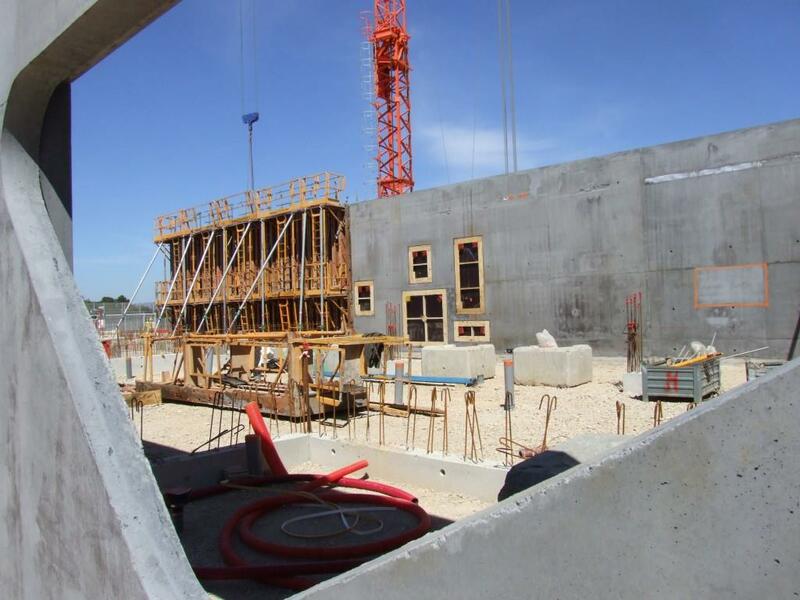 The top three levels of ITER Headquarters have front-row seats to the work on the platform. 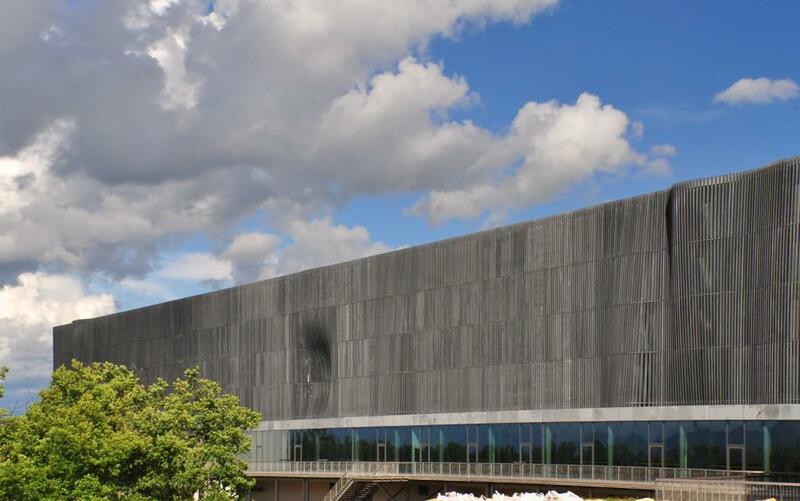 Beginning next fall, the building will be occupied. 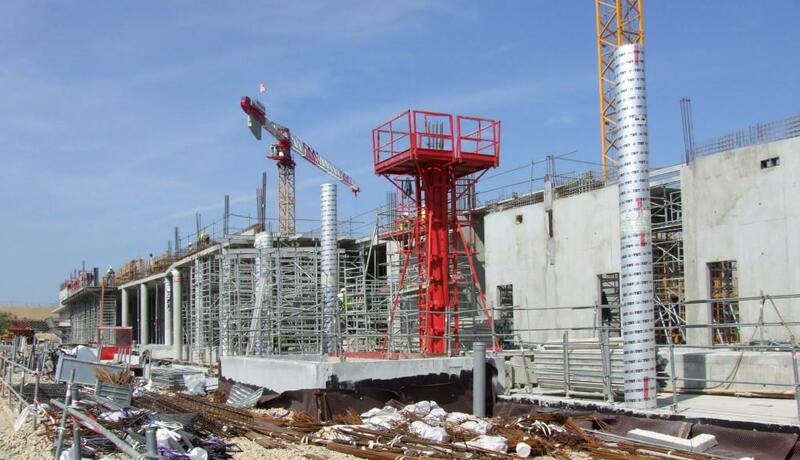 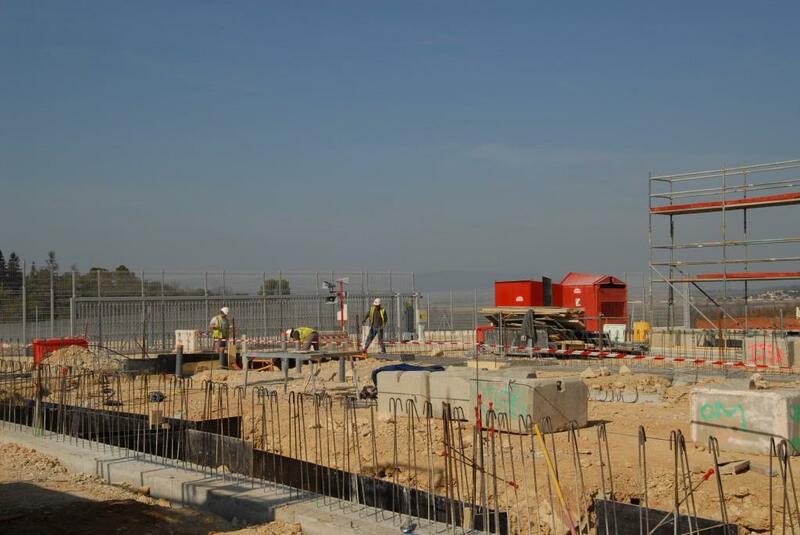 Across a quiet platform, work continues on the inside of the future ITER Headquarters. 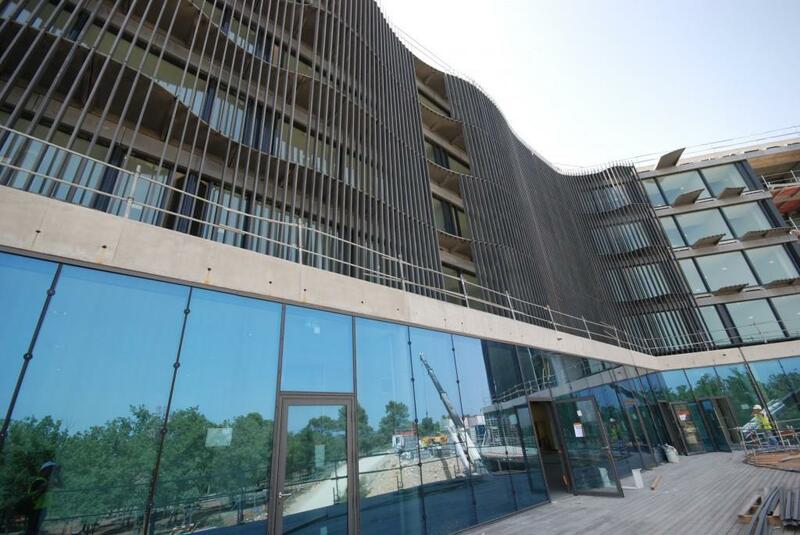 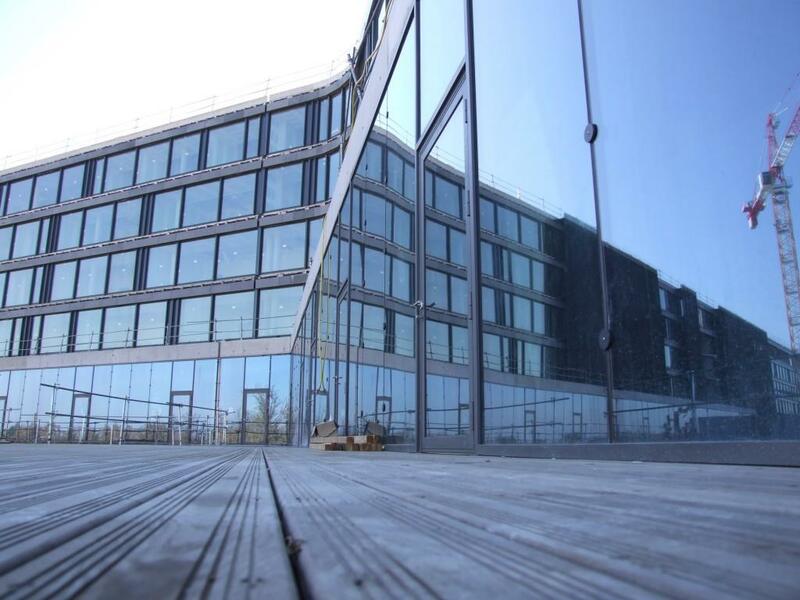 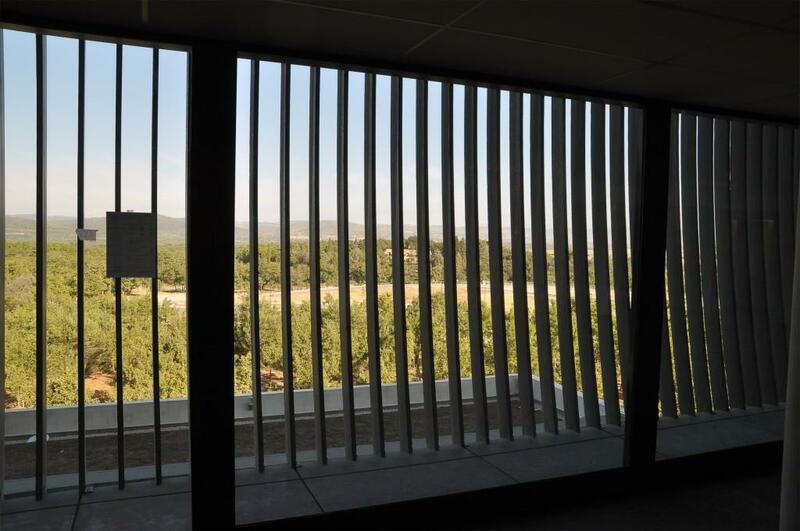 On the top left of the building, work begins to install the exterior venetian blinds that will protect the offices from Provence's 300 days of strong sunlight per year. 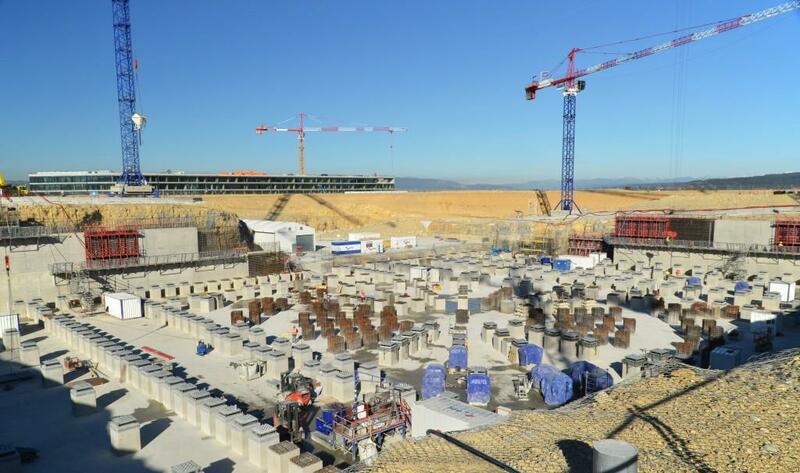 The top floors of the Headquarters building will have an unparalleled view of the 39 buildings and facilities that make up the ITER fusion laboratory. 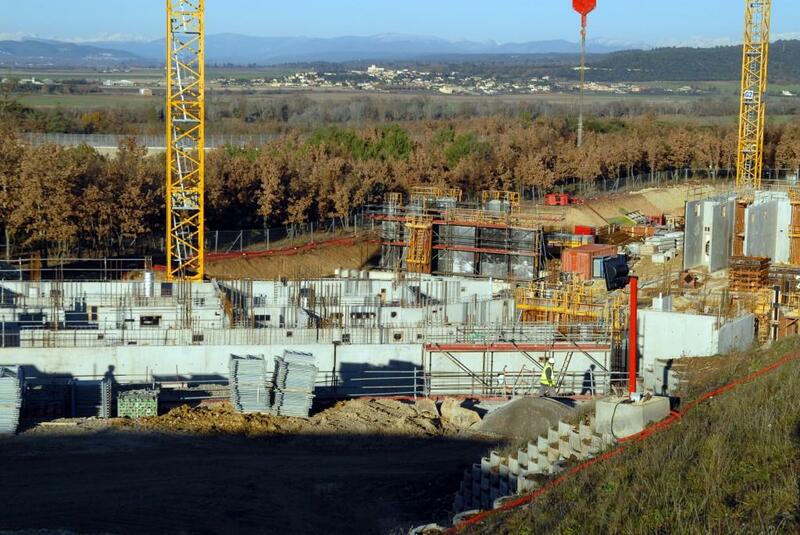 The future entrance to the ITER Headquarters on the northeast corner of the building. 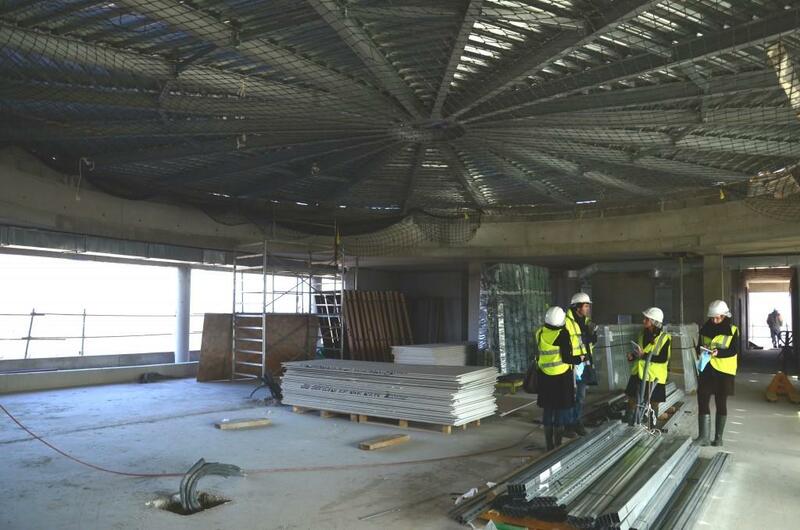 On the top floor of the building, a circular Council Room for 80 is under construction. 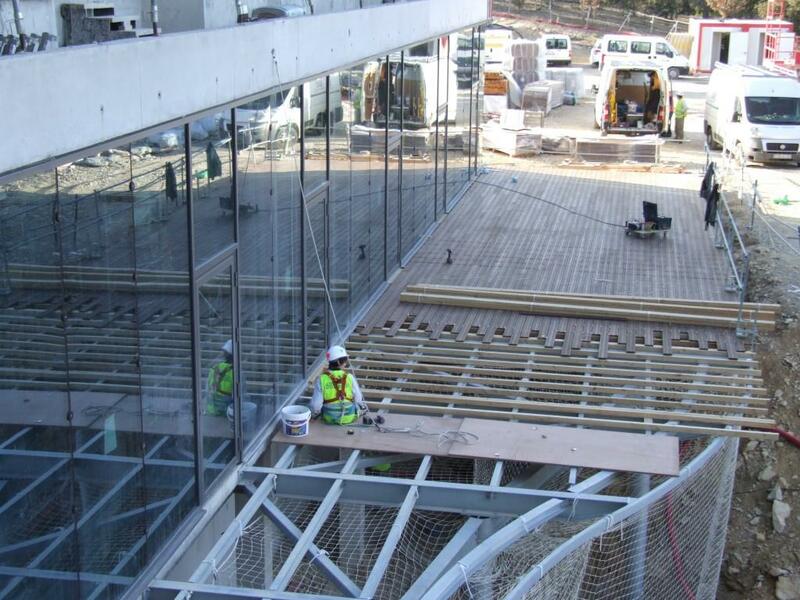 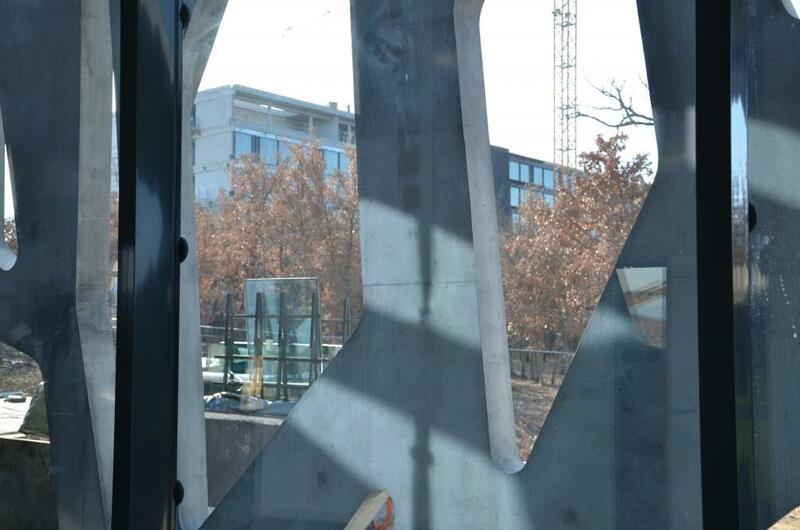 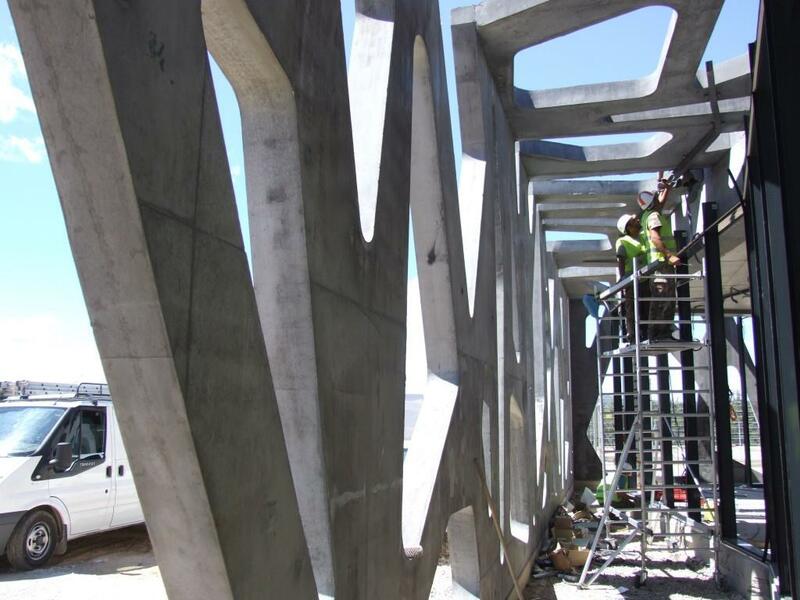 Workers install the metal structure that will support a terrace accessible from the canteen. 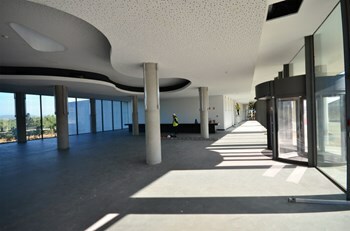 Occupying the first floor of the building, the cafeteria spans its entire width from east to west. 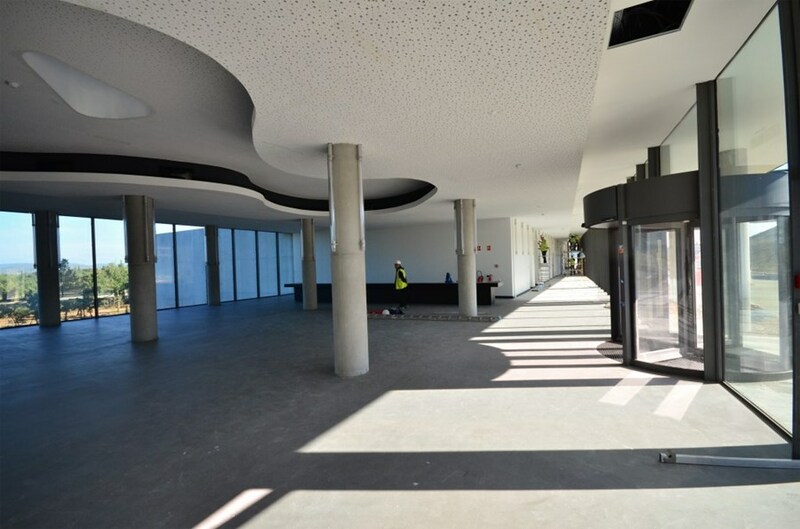 The doors visible in this photograph exit to an outside terrace and stairs down to a grassy area. The bright and spacious entry hall of the ITER Headquarters building faces the platform. 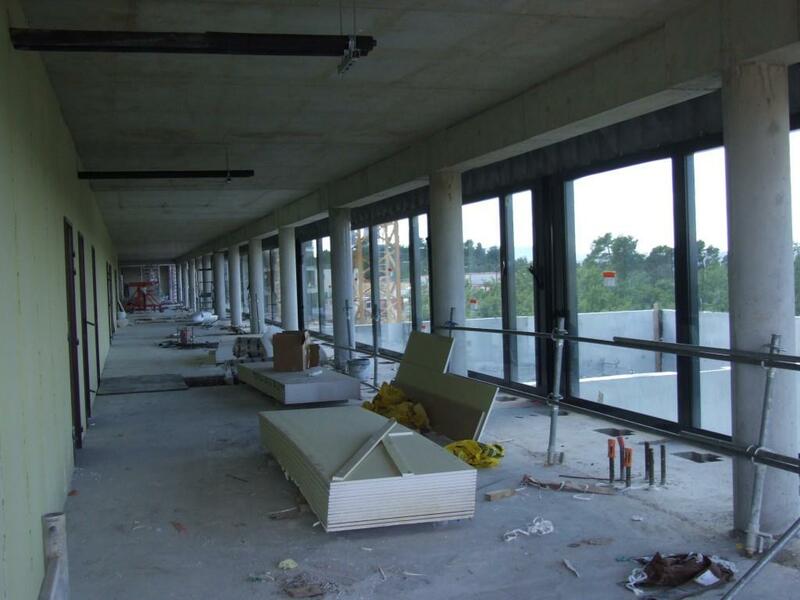 Elevators heading from this area to the upper floors have already been installed. 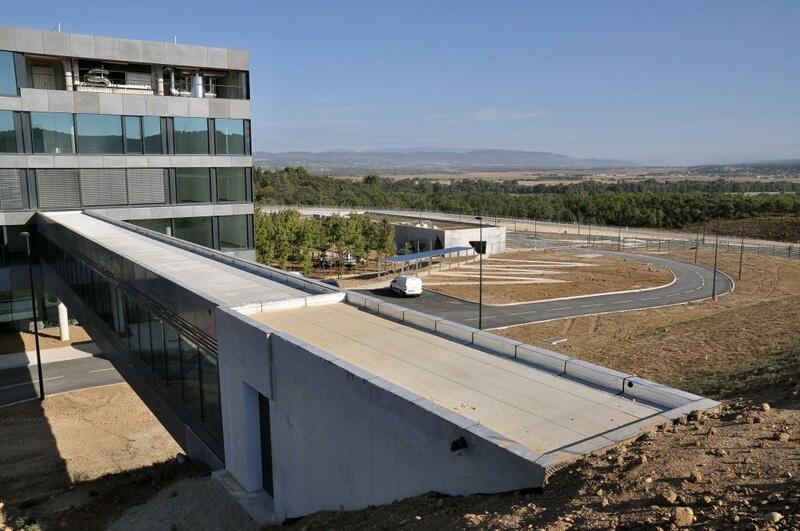 Far below, the Site Access Control Building (not yet equipped with its "green" roof). 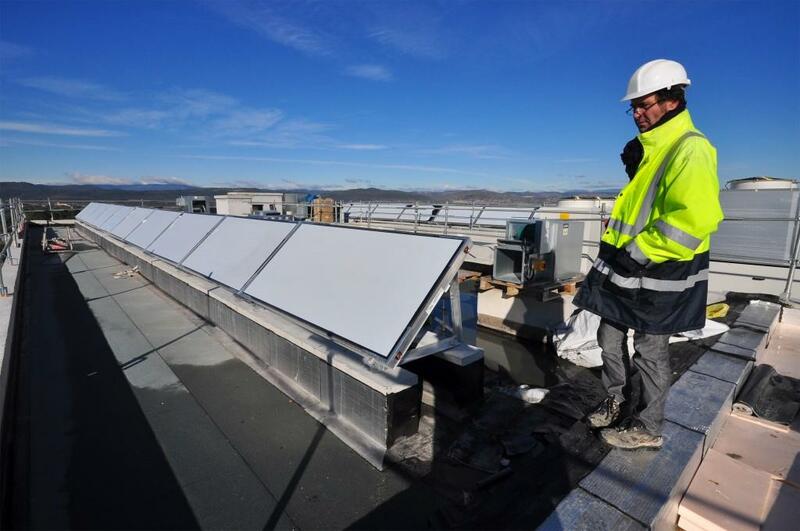 Seventy-five metres of solar panels installed on the roof will furnish the cafeteria's needs in hot water. 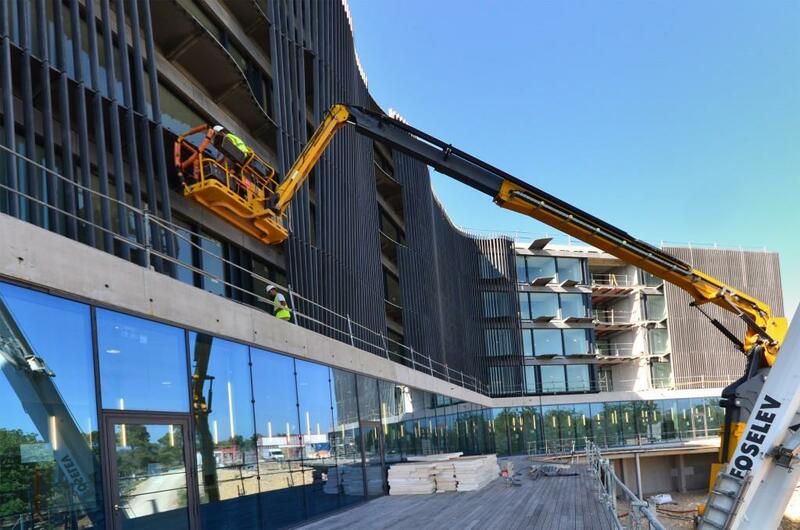 The installation of bay windows in the six interior patios was completed in December. 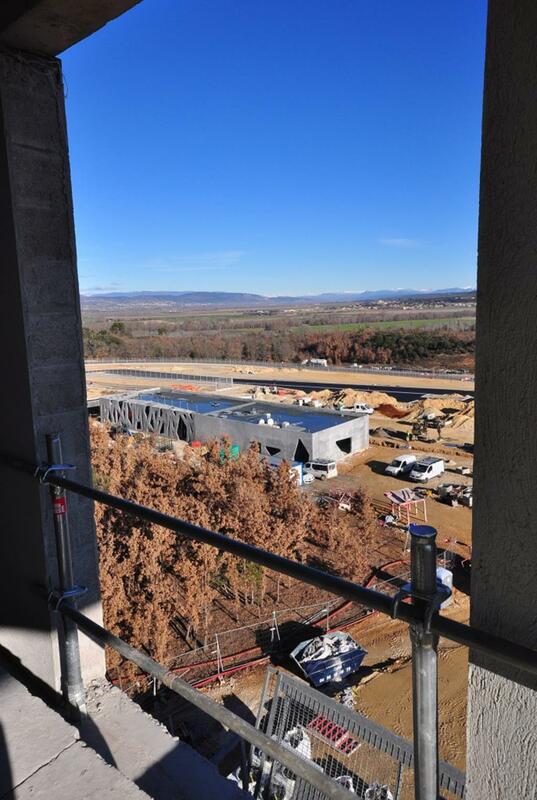 From the upper floors of the ITER Headquarters, the view over the platform is spectacular. 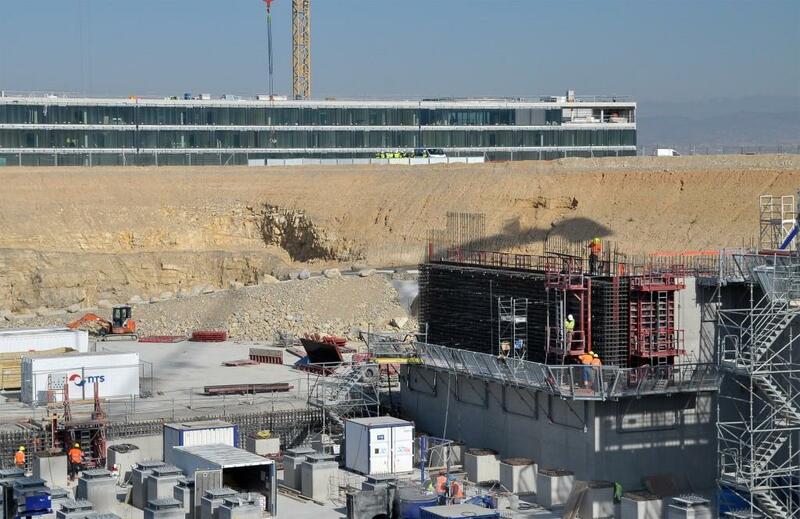 ITER Headquarters, seen through the atypical openings of the Site Access Control Building. 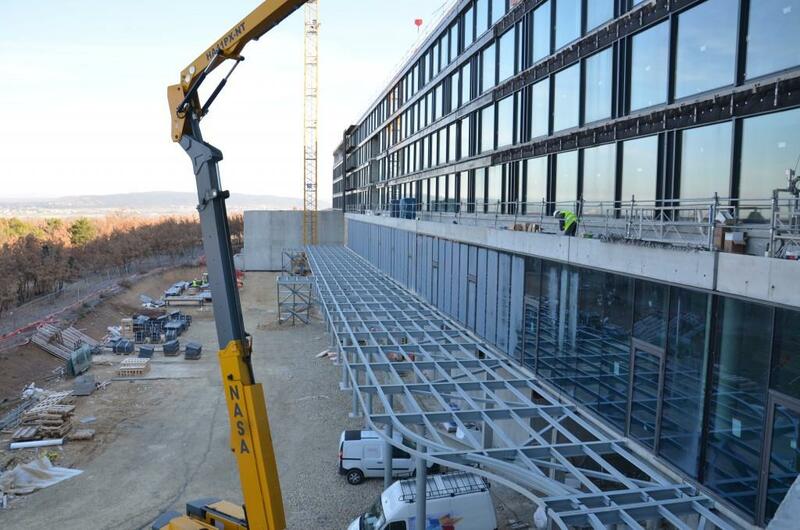 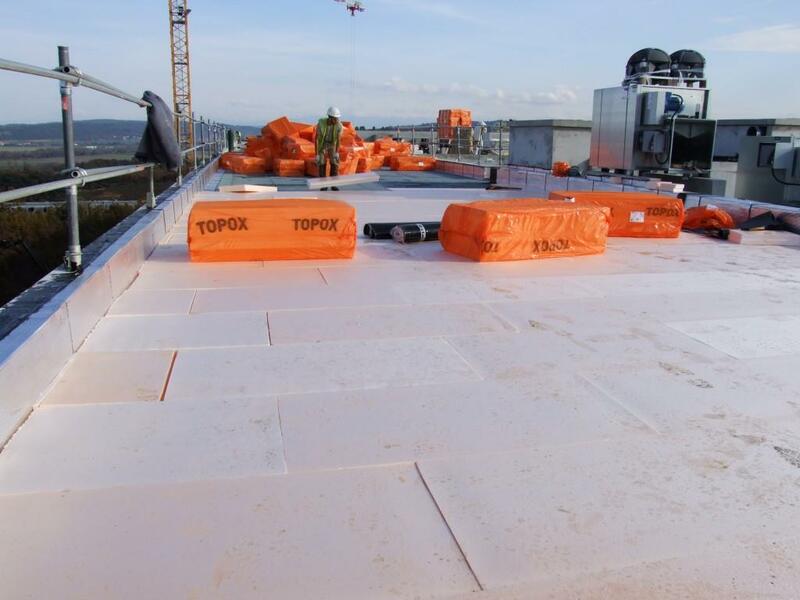 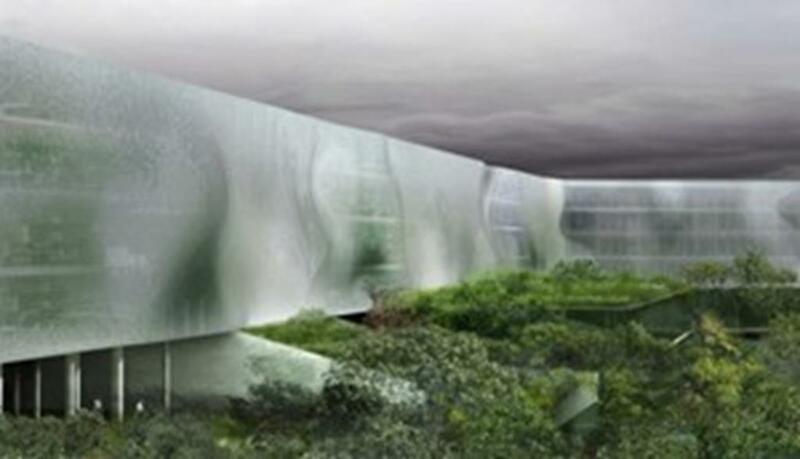 The 550m² Site Access Control Building will be equipped with a "green" roof to improve climate control. 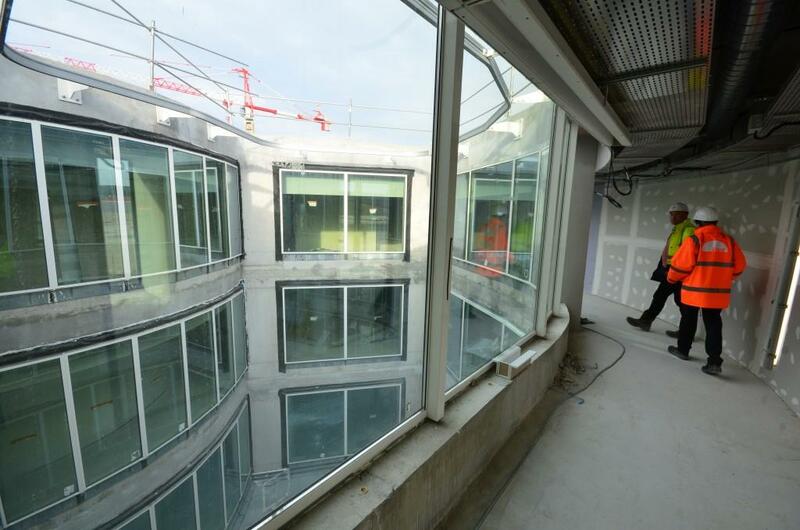 Looking out from one of the large, open-plan offices on the west side of the building. 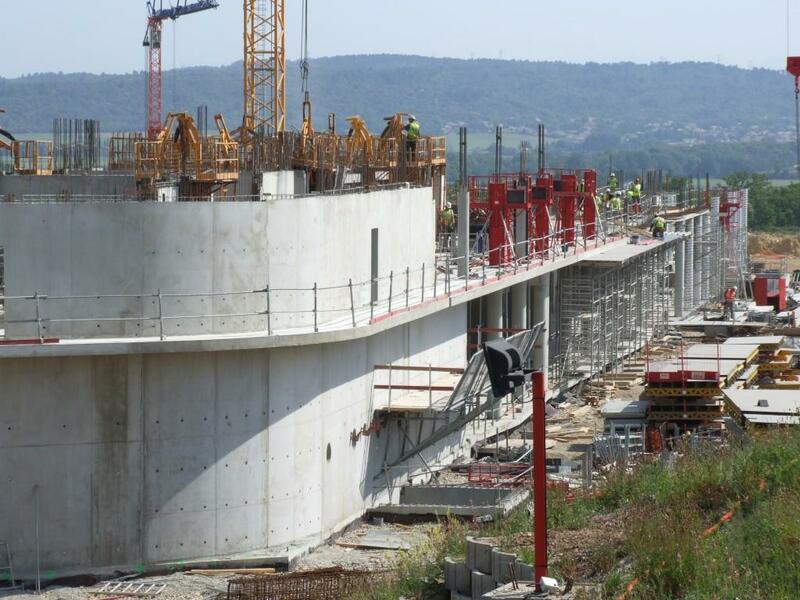 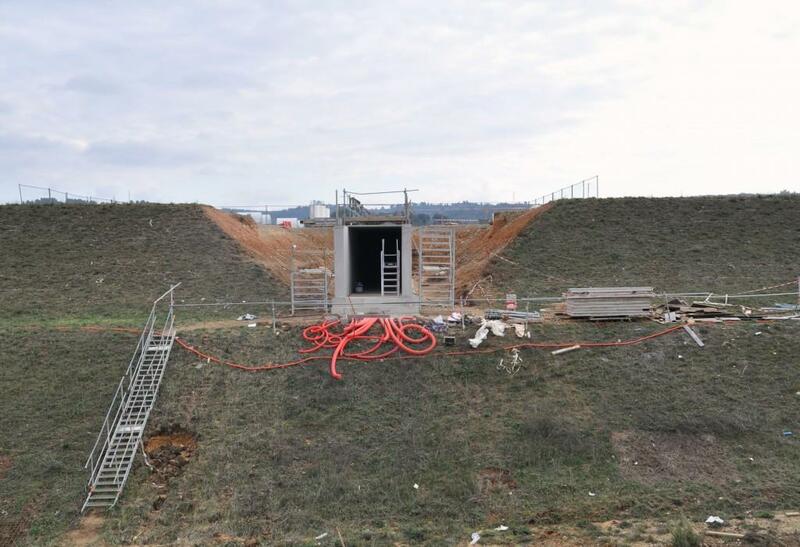 A 33-metre-long metal footbridge will connect Headquarters to this tunnel in the platform, which will lead to the ITER Control Room. 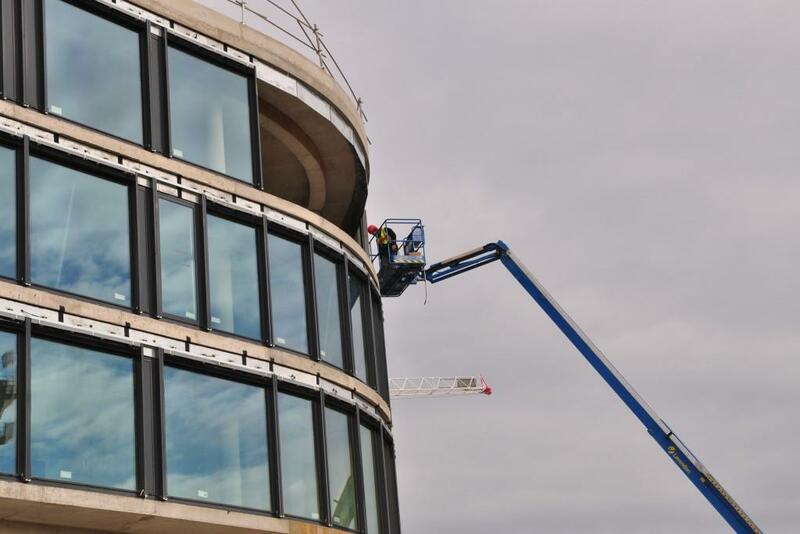 The last windows are installed along the curved south-eastern face of the building in December 2011. 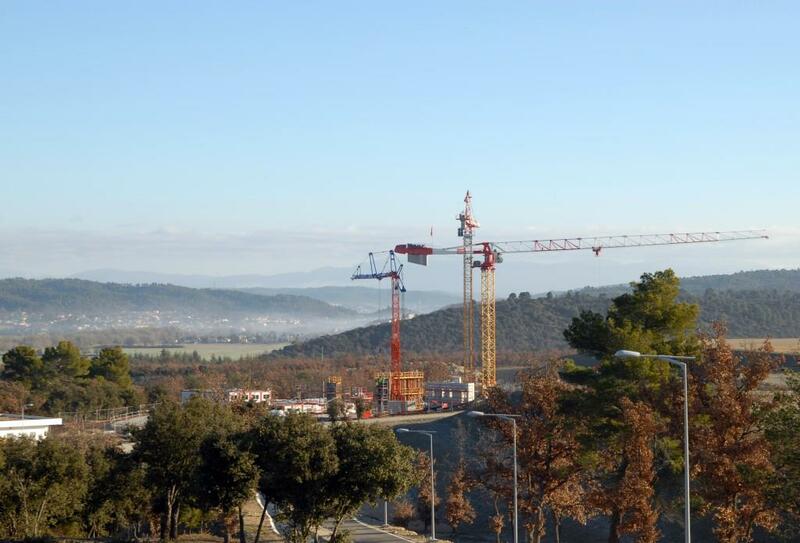 The Provençal village of Corbières (approximately 10 kilometres distant) seen from over the top of the Headquarters building. 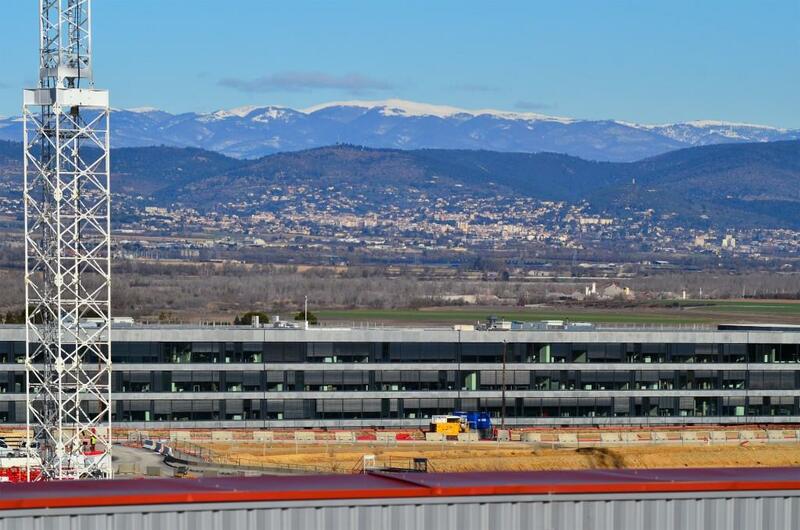 Fresh October snow in the pre-Alps is visible from the ITER platform on a clear day. 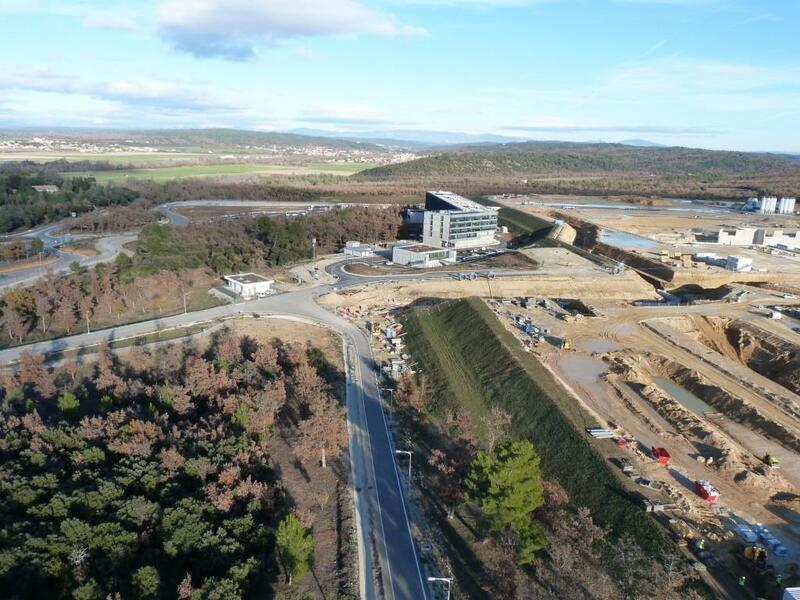 Approximately 250 km beyond the ITER Headquarters are the Mont Pelvoux (far left, 3,946 m) and the Barre des Écrins (left, 4,102 m). 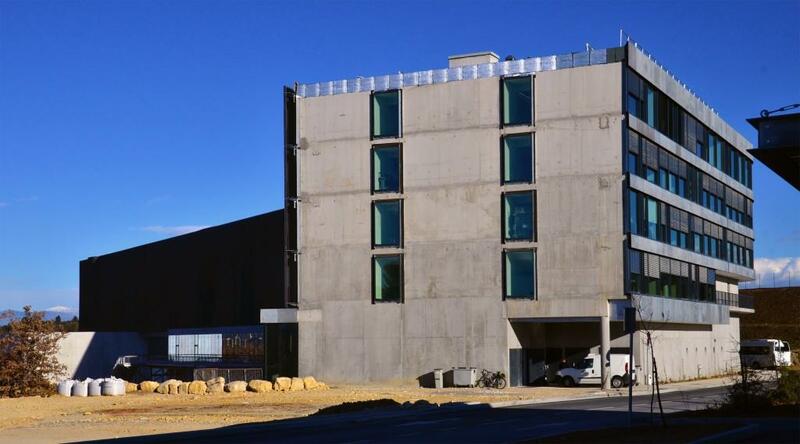 Natural light predominates on the upper floors of the ITER Headquarters. 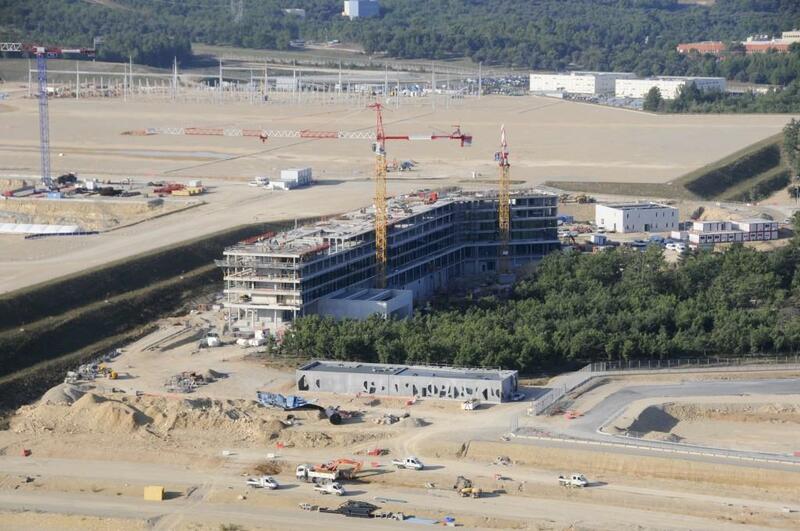 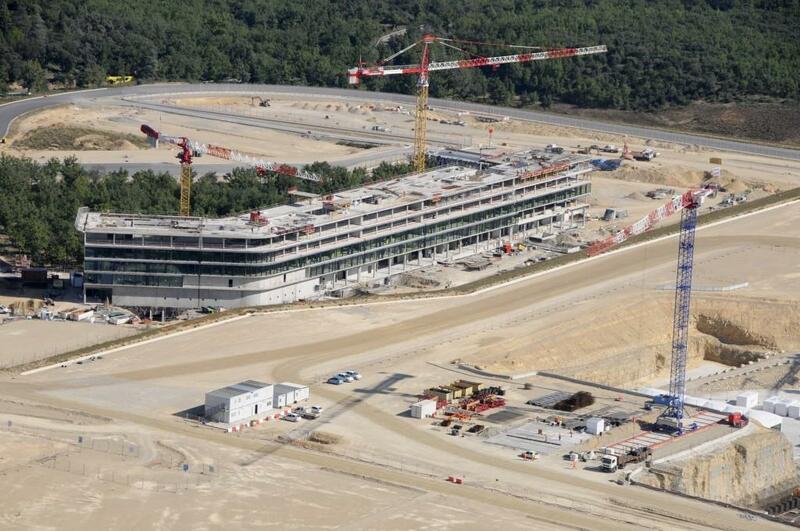 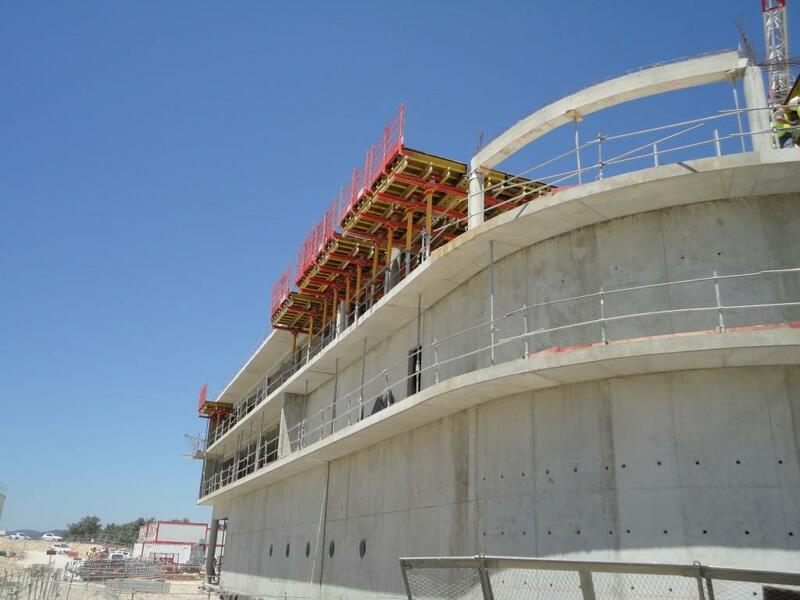 Work on the top floor of the ITER Headquarters nears completion in September 2011. 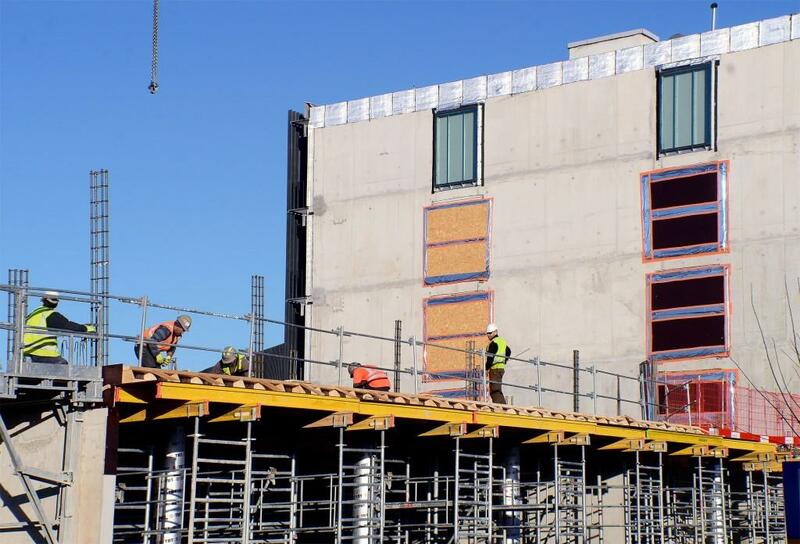 The building will have a ground level plus five floors—a total of six levels in all. 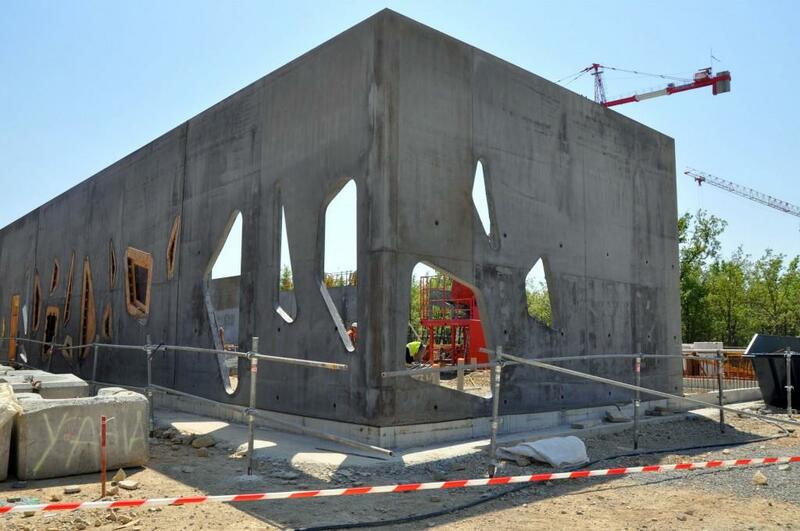 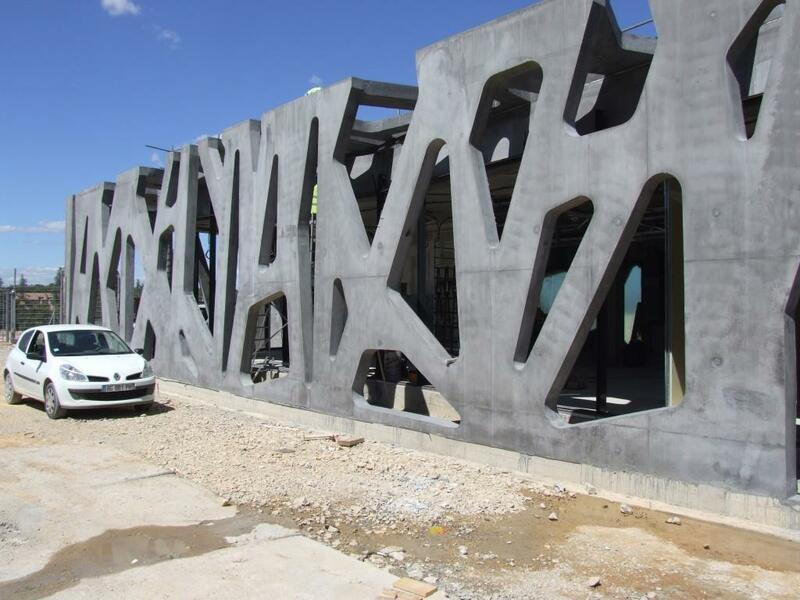 The first walls and asymmetric openings of the Site Access Control Building. 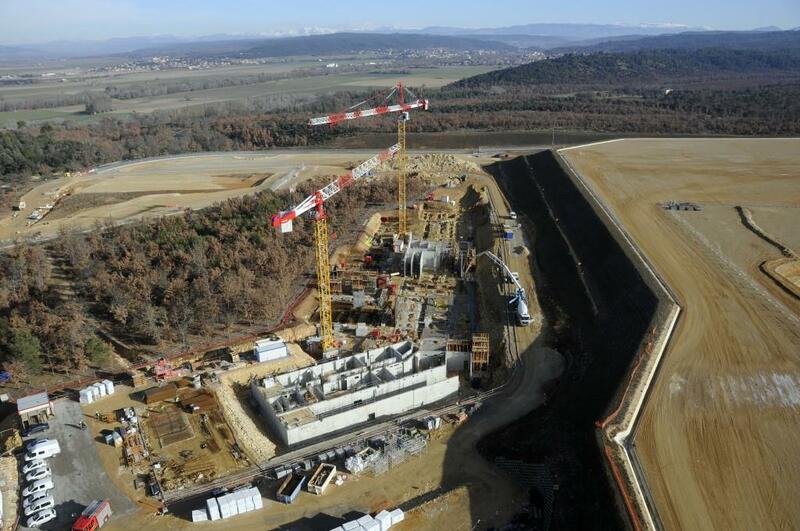 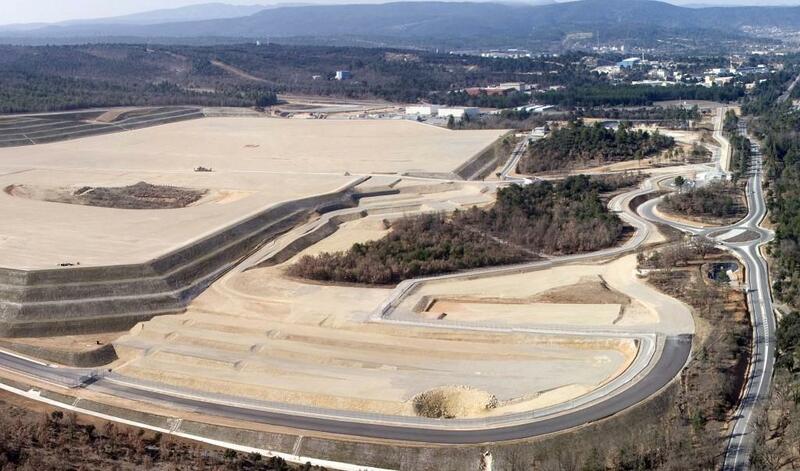 The ITER Headquarters building was completed in August 2012 and was extended by 35 m two years later. 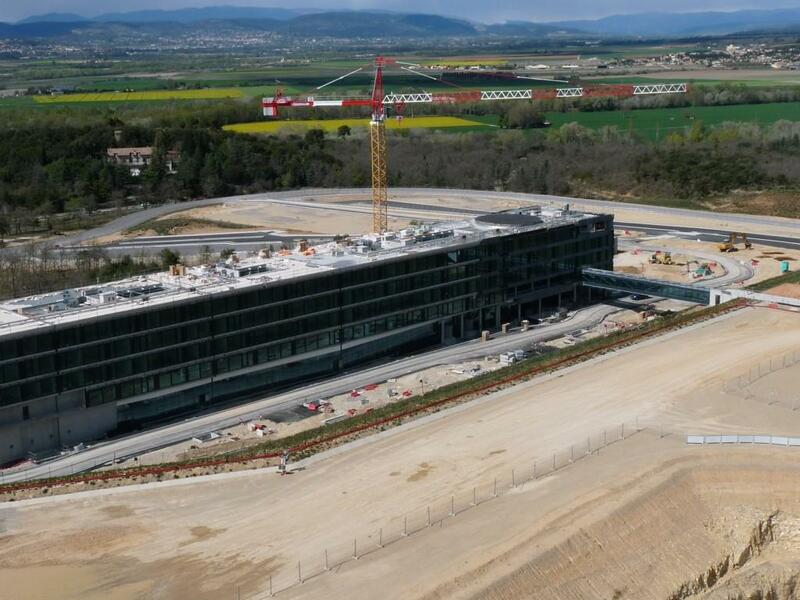 Nestled up against the northern corner of the ITER platform, the wing-shaped ITER Headquarters includes offices for 800 people, meeting rooms, a Council Chamber, an auditorium, a library, a canteen and a virtual reality room. 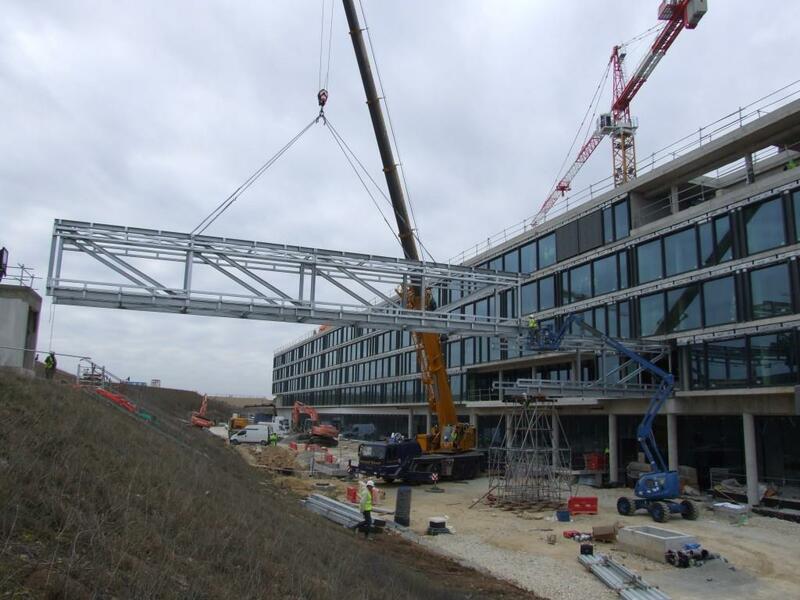 A footbridge links the first floor of the Headquarters to a tunnel in the platform, which will provide direct pedestrian access to the Tokamak Control Room. 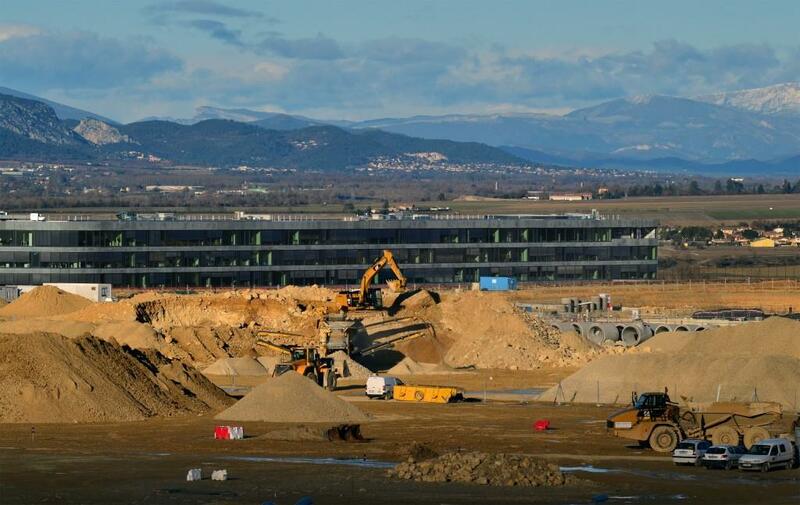 The innovative design of the ITER Headquarters (20,500 m²) was conceived by local architects Ricciotti and Bonhomme, who also designed the Provence-Alpes-Côte d'Azur International School in Manosque that was completed in 2010. 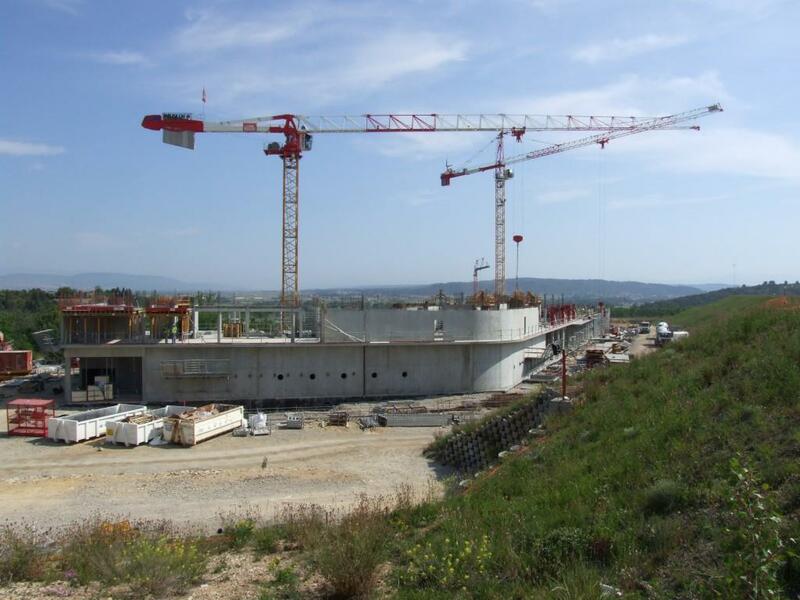 The construction of the ITER Headquarters was financed by the European Domestic Agency, F4E, and France as Host country. 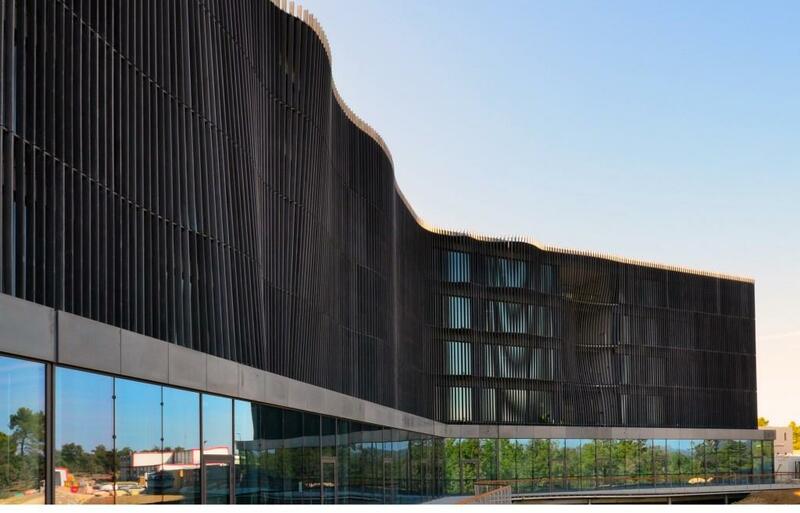 All along the 165 metres of the Headquarters' northwest façade, vertical sunshades create a striking visual effect; these slats provide protection from the sun and create the impression of an undulating external veil, enhancing the building's integration into the landscape. 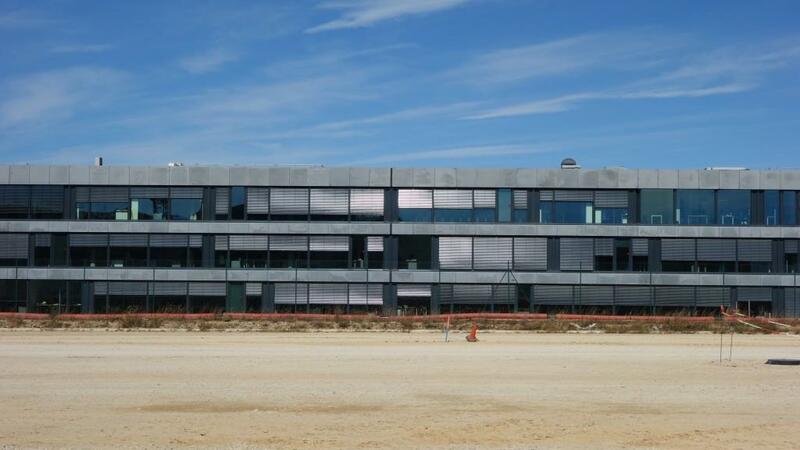 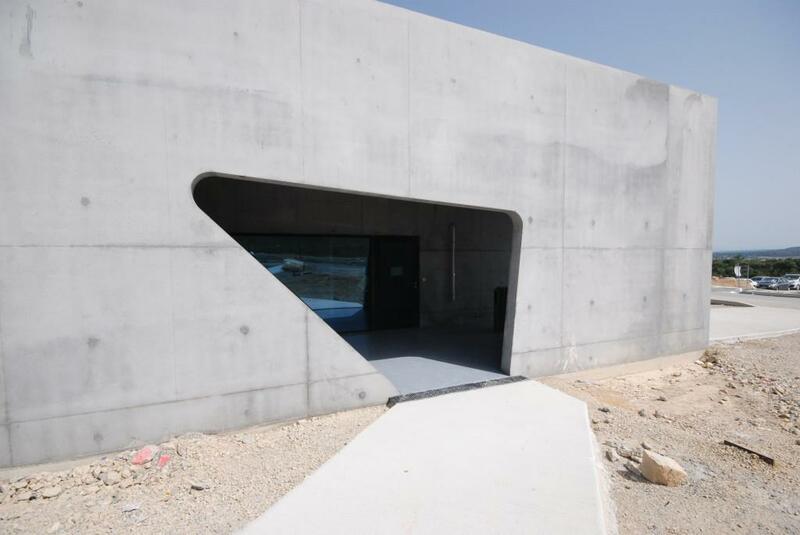 Made of highly resistant fibre concrete, the sunshades also lend structural strength to the building. 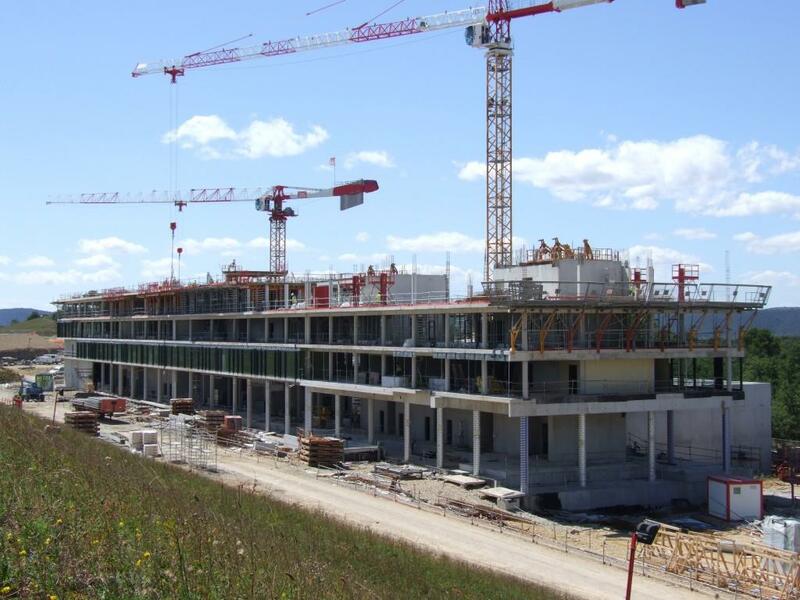 Construction of the six-storey building (one basement level and five storeys) was completed in August 2012. 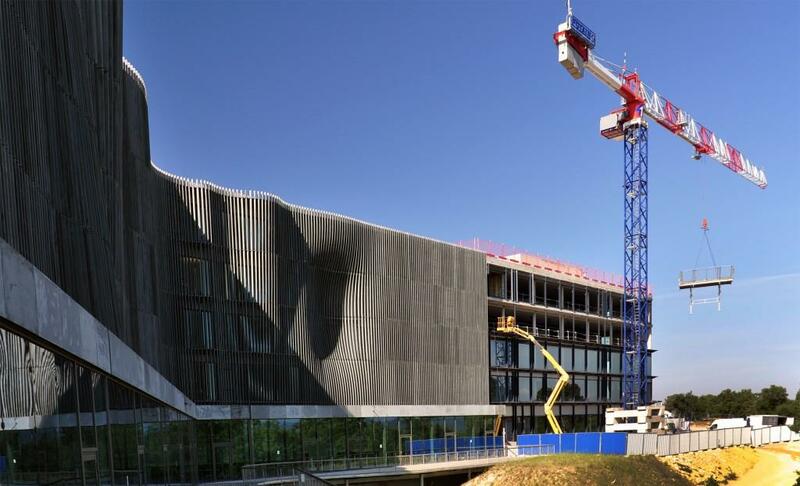 On 17 January 2013, the building was inaugurated in the presence of the EU Commissioner for Energy, Günther H. Oettinger, and the French Minister of Higher Education and Research, Geneviève Fioraso. 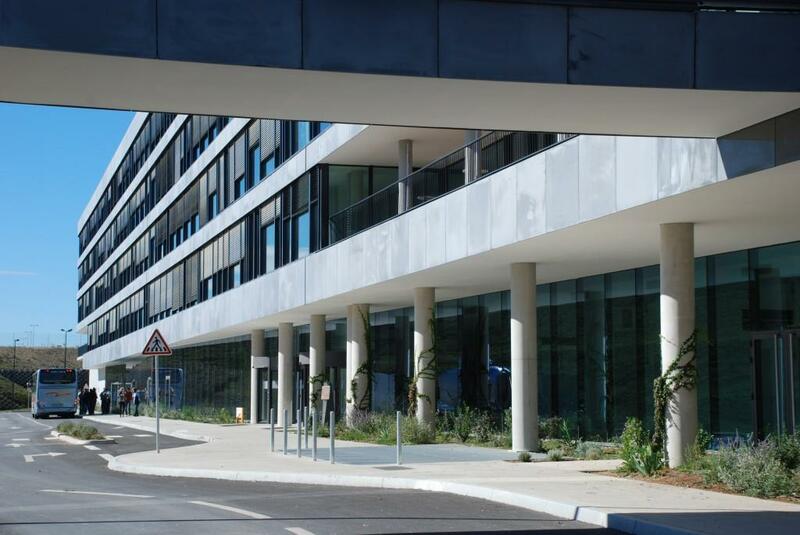 A 35-metre extension to the building was completed in 2014.